Please contact me regarding any errors in the text. To read a comtemporary newspaper report about this flood, click here. This 1844 report, on the extraordinary freshet of August 5, 1843, is at times frightening in its detail of the power of the flood. It is also prescient in its realization that man-made amenities and clearing of woodlands were contributing factors to rapid rises in stream levels during rainstorms. All the watersheds of Delaware County are mentioned, including Cobbs Creek, Darby Creek, Crum Creek, Ridley Creek, Chester Creek, Brandywine Creek, and Ithan Creek (which the authors refer to here as Ithen). Some of the watersheds, as the report reveals, were more severely affected than others. I originally purchased this report with the hope that it would reveal details about the mills and dams along Cobbs Creek, but since this was one of the watersheds barely affected by the disaster, it receives little attention. Delaware County Institute of Science (organized in 1833) still holds regular meetings in its 19th century museum building in Media, the seat of Delaware County. Original copies of many of their Proceedings are still available for sale. For information on museum open hours, guided tours, classroom programs, evening lectures, and volunteer opportunities, contact DCIS at (610) 566-5126. Footnotes have been placed directly after the main text to which they refer. Erratum noted at the end of the report have been corrected in this Web version. I have slightly altered punctuation to make the sometimes archaic language more easily readable. In the year 1843 there occurred in this neighborhood one of the most remarkable phenomena of which local history gives an account. "The Flood of 1843" is considered by those who remember it as one of the milestones of Delaware County history. So extraordinary was this flood and so great the damage done, that shortly after the occurrence a committee of the Delaware County Institute of Science was appointed to investigate and make report in regard to it. The members of this committee were Dr. George Smith, John P. Crozer and Minshall Painter. A number of copies of the report of this committee were printed for private circulation, but very few of these copies are now in existence. In response to the frequent inquiries that have been made for data concerning the Flood of 1843, it has been deemed advisable to reprint the report in full in these Proceedings. 1st. The time of the commencement and termination of the heavy rain. 2nd. The direction of the wind at different periods of time during the day--its violence, and the time of its greatest violence. 4th. The greatest height of the flood above the usual level of the water in the several creeks, and the time at which the water was at its greatest height. 5th. An account of the damage done to bridges, manufactories, mills, mill-dams, dwellings, &c.; together with an estimate of the loss sustained by the County, and by individuals, in consequence of the destruction or damage done to their property. The loss occasioned by the destruction of crops, fences, etc. 6th. The number of lives lost; the names and ages of the individuals, and the particulars connected with their loss: also any facts connected with the rescue of persons from drowning who were in imminent danger. 7th. Any facts evincing the power of rapid currents of water in transporting earth, sand, rocks, and other materials. 8th. Any other facts which may be considered important or interesting. As voluminous as these details may appear, it is highly probable that many interesting particulars may not have come to the knowledge of the committee. They feel free, however, to state, that so far as they have undertaken to give facts and estimates, they have very great confidence in their general accuracy. A meteorological phenomenon so unique in its character as the storm of the fifth of August, together with the almost instantaneous rise in the waters of several large streams with their numerous tributaries, could hardly fail to give rise to a number of philosophical problems not very easy of solution by persons unaccustomed to such investigations. On this account it has been a source of regret to the committee, that the subject had not been confided to hands more skillful and experienced in such matters. In the few explanations, however, which they have attempted of any subject which presented to their minds the least difficulty or doubt, they have been careful to give all the facts which to them appeared at all relevant, so that the correctness of their conclusions can be readily tested by others. TOPOGRAPHICAL VIEW OF DELAWARE COUNTY. Before proceeding to detail the results of their examinations and inquiries, the committee have considered that it would not be amiss to present a brief topographical sketch of the county, drawn particularly with a view of illustrating the subject under examination. In point of territory, Delaware county is the smallest [PAGE 4] county in Pennsylvania, except Philadelphia. It is bounded by Philadelphia county on the east; by Montgomery on the northeast; on the northwest by Chester county, and on the south by the state of Delaware and Delaware river. It contains about 177 square miles. The county is principally drained by five large creeks, four of which, viz. : Chester, Ridley, Crum and Darby creeks are mill streams before they enter the county. These streams have a general course, a little east of south, and after traversing the whole breadth of the county, empty into the Delaware. The only material variation from this general course is in Darby creek, after it reaches the head of tide; from which point it has a southerly and southwesterly meandering course of about nine miles before it reaches the Delaware. Cobb's creek rises in the township of Haverford, and after crossing the southern border of that township, it forms the boundary line between this county and Philadelphia to the point where it empties into Darby creek, a short distance below the head of tide water. The Brandywine forms a part of the western boundary of the county. Chester creek enters the county by two principal branches designated "East" and "West." These are both good mill streams, and after their junction at Crozerville, form the largest of the creeks above named, except the Brandywine. This creek unites its water with the Delaware river, at the borough of Chester. Darby creek, the next in point of size, also has its origin in two principal branches, which may be distinguished by the terms "East" and "West." 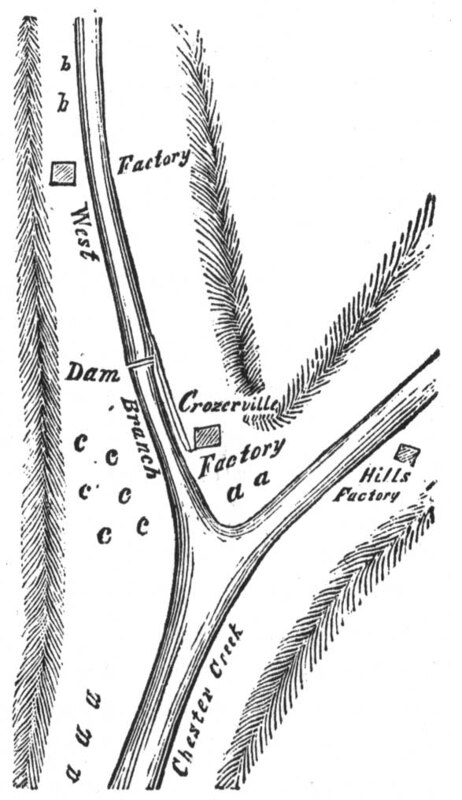 These branches unite at the flour mill of Levi Lewis, in Radnor township, and after the united stream has received Ithen [now called Ithan] creek, it reaches the head of tide, at the village of Darby. Crum and Ridley creeks are each large streams before they enter Delaware county. They pursue the same general course, and scarcely at a distance of more than two miles from each other. At one point [PAGE 5] they approach each other within about half a mile, but afterward diverge and enter the Delaware river by separate mouths, a short distance above Chester. Besides these there may be enumerated the Gulf creek, which has an easterly or northeasterly course and empties into the Schuylkill river a few miles below Norristown, in the county of Montgomery; Naaman's creek, which empties into the Delaware river, below Marcus Hook, and within the borders of the State of Delaware; Hook creek, which empties into the Delaware at Marcus Hook; Little Crum creek, which empties into Crum creek near the Delaware; Ithen creek and Mucanipates, branches of Darby creek; Naylor's run, a branch of Cobb's creek; Green's run and Dismal run, branches of Ridley creek; Green's creek, a branch of Chester creek; Beaver and Valley creeks, branches of the Brandywine, besides many other streams of a sufficient size to be employed in propelling machinery. Source of Cobb's creek, 392 feet above tide. Source of Ithen creek, 399 feet above tide. Source of Darby creek, 440 feet above tide. Source of Crum creek, 520 feet above tide. Source of Ridley creek, 520 feet above tide. The elevation of the source of Chester creek was not ascertained with the same degree of accuracy, but that of its east branch probably exceeds Crum or Ridley creeks. A large proportion of this fall, particularly within the borders of Delaware county, had been turned to account in propelling mills and manufactories of various kinds, so that previously to the inundation there could have been enumerated within the county 28 Cotton Manufactories; 15 Woolen Manufactories; 32 Flour Mills; 45 Saw Mills; 8 Paper Mills, and 10 Mills for various purposes, exclusive of those used for cleaning clover seed and grinding plaister. These establishments necessarily gave rise to a variety of other improvements on the margin of the several streams, and in many instances, within the scope of the inundation. Delaware county had also become celebrated for the number and substantial character of her bridges. Bridges had been erected on all the main leading highways where they cross the several creeks, and many bridges had also been erected on the less frequented roads. Previously to the inundation there could have been enumerated 45 bridges which [PAGE 7] had been erected at the expense of the county. Of these 19 were stone arch bridges; 4 Lattice bridges; 1 Chain bridge; 21 Wooden bridges of different constructions, besides three stone arch bridges, and one lattice bridge, built at the joint expense of this county and the county of Philadelphia; two wooden bridges built in conjunction with Chester county. Bridges over the smaller streams, which are not included in the foregoing enumeration, were erected at the expense of the several townships. Exclusively of the alluvial meadows, bordering on the river, but a small part of the soil of Delaware county is naturally of a very superior quality. But its manufacturing population, and its proximity to a large city, afford such a certain market for its surplus agricultural produce, that the farmers have for many years turned their attention to its improvement, by means of the application of lime and other manures, so that in point of productiveness, Delaware county is not now surpassed by any other county in the Commonwealth. The flats bordering on the creeks are mostly cultivated--in the vicinity of manufacturing establishments they were frequently occupied as gardens by the operatives. It will be apparent, from the foregoing hasty sketch, that scarcely any country district of the same extent could be found where a similar visitation would have been attended with such disastrous consequences. The morning of the 5th of August, at early dawn, gave indications of a rainy day. The wind was in the east, or [PAGE 8] [PAGE 8] north east, and the clouds were observed to have the appearance which indicated a fall of rain. The sun was barely visible at rising, but in a very short time afterwards the whole sky became overclouded. At about seven o'clock, A. M. it commenced raining, and continued to rain moderately, with occasional remissions, but without any very perfect intermission until noon, or later. This was a general rain, which extended much beyond the limits of Delaware county in every direction. Up to twelve o'clock, [P.]M. but one half inch of rain had fallen, as accurately measured by Dr. J. W. Ash, of Upper Darby; and up to the commencement of the great rain storm, it is not probable that more than three-fourths of an inch had fallen in any part of the county. This general rain scarcely caused an appreciable rise in the streams, but it had the effect of fully saturating the surface of the ground with water, to the depth of some inches, and in this way contributed to increase the flood in some degree, beyond what it would have been, had the subsequent heavy rain fallen on the parched earth. The air was cool for the season, and the general rain now spoken of, had very much the appearance of a regular easterly storm, with the exception, perhaps, that the clouds wore a more lowering appearance. No general description of the heavy rain which followed, and which caused the inundation, will exactly apply to any two neighborhoods--much less to the whole extent of the county. In the time of its commencement and termination --in the quantity of rain which fell--in the violence and direction of the wind, there was a remarkable want of correspondence between different parts of the county. It may be observed, however, that comparatively little rain fell along its southern and southeastern borders. It will hereafter appear, that Cobb's creek, on the eastern margin of the county, and the Brandywine on the west, were not flooded in any very extraordinary degree, so that it will be evident that the greatest violence of the storm was expended on the district of country which is drained by [PAGE 9] Chester, Ridley, Crum, Darby, one or two tributaries of the Brandywine, and the Gulf creeks. This district will embrace a part of Chester county, and a small part of Montgomery, but including these, the whole extent of country which was inundated will not exceed in area the territory embraced within the county of Delaware. The extent of territory which was inundated, was also much greater than that which was subjected to any very extraordinary fall of rain. The amount of rain which fell on that part of the county which borders on the Delaware river, and embraces the mouths and lower parts of the inundated creeks, was not sufficient to produce even an ordinary rise in the streams, and to this circumstance may in part be attributed the very unprepared state in which the inhabitants of this district were found for the mighty flood of waters which was approaching to overwhelm them. The very rapid rise in the water, without apparently any adequate cause, was also well calculated to increase the alarm in this district much beyond what it would have been, had the quantity of rain which fell, borne a comparison with that which fell in the upper parts of the county. As a general rule, the heavy rain occurred later, as we proceed from the sources of the streams toward their mouths. The quantity of rain which fell will also decrease as we proceed in the same direction, particularly from the middle parts of the county downwards. In those sections of the county where its greatest violence was expended, the character of the storm more nearly accorded with that of a tropical hurricane, than with anything which appertained to this region of country. The clouds wore an unusually dark and lowering appearance, of which the whole atmosphere appeared in some degree to partake, which circumstance, no doubt, gave that peculiarly vivid appearance to the incessant flashes of lightning which was observed by everyone. The peals of thunder were loud and almost continuous. The clouds appeared to approach from different directions, and to concentrate at a point not very distant from [PAGE 10] the zenith of the beholder. In many places there was but very little wind, the rain appearing to fall in nearly perpendicular streams; at other places it blew a stiff breeze, first from the east or northeast; and suddenly shifting to the southwest; while at a few points it blew in sudden gusts with great violence, accompanied with whirlwinds, which twisted off and prostrated large trees, and swept every thing before it. So varied, indeed, was the character of the storm at different places, that it would be exceedingly difficult to present any very satisfactory account of it, except by embodying the remarks of different observers at different places. The committee have therefore adopted that course. As observed by the Hon. Henry Myers, of Concord township, the heavy rain commenced at about a quarter to three o'clock, P.M., in that neighborhood--the wind about east-southeast, but it veered so rapidly, retrograde to the sun's motion, that the clouds appeared to verge to a centre over the western section of Delaware county, from several points of the compass at the same time--the rain falling in torrents like the bursting of a water spout. At about a quarter to 4 o'clock the wind had nearly boxed the compass, and blew a gale from west-southwest, and about that hour a tornado, or whirlwind, passed across the southern part of Concord, about a quarter of a mile in width, prostrating forest and fruit trees, and scattering the fences in every direction. In the neighborhood of Concord, the rain continued about three hours, and the quantity of rain which fell in that vicinity, as nearly as ascertained, was about sixteen inches. Judging from the rise in the waters of the West branch of Chester creek, which drains this particular district of country, it is probable that the quantity of rain which fell in this vicinity, equaled, if it did not exceed, that of any other district in the county. As observed by Mr. Adam B. Williamson, of Newtown township, the heavy rain commenced about two o'clock, and [PAGE 11] terminated about five o'clock P.M.--the wind, during the rain, nearly northwest. There was a heavy blow of wind, but not violent. The quantity of rain which fell, was between 11 and 13 inches. At Newtown Square, in forty minutes immediately before five o'clock, it was ascertained that five and a half inches of rain fell. As observed by Mr. George Palmer, residing in the northern part of Radnor township, the heavy rain commenced about 4 o'clock, P. M. and terminated at about 6 o'clock. At the commencement of the heavy rain the wind blew from the south or southwest but changed to the SE about four and a half or five o'clock, from which direction came the heaviest rain. The wind did not blow with violence. As observed by a member of the committee, at his residence in Crozerville, the storm appeared to have concentrated at that place, and spent itself with awful force. The morning had been lowering with occasional showers of rain--the air rather cool for the season. After noon the sky was thickly overcast, and clouds floated slowly in various directions; the wind, as noted by a weather vane, northeast. After two o'clock, thunder was heard at a distance, which soon became louder and more frequent. About 3 o'clock under an unusually dark sky, rain commenced falling in torrents, accompanied with vivid lightning, and almost continuous peals of thunder. The lightning was more vivid than ever before witnessed by him in the day time, nor had he ever before heard so much loud thunder at one time. The heavy rain terminated a few minutes before 6 o'clock. Crozerville lies in a basin surrounded by steep acclivities. In every direction from these hills, sheets of water poured down, and mingling with the swollen current below, presented, together with the rapid succession of forked lightning, a scene of awful sublimity. As observed at the residence of Enos Painter, in Middletown, the greatest violence of the rain storm lasted from 3 till 5 o'clock, P.M.--the wind blowing from every quarter during the storm. It did not blow with very great violence, [PAGE 12] [PAGE 12] though a few trees and some fences were blown down, and much of the corn prostrated. The amount of rain which fell was not ascertained, but it was undoubtedly the heaviest rain which had occurred at that place during the recollection of any person living. As observed at Edward Lewis' mills, in Middletown, the heavy rain commenced between three and four o'clock, and ceased about five P. M.--the wind changeable all the afternoon, but at no time violent. As observed at Samuel Bancroft's, in Nether Providence, the heavy rain commenced a quarter before 5 o'clock, and continued till a quarter past 6--the wind blowing from the east and southwest. At the residence of Richard T. Worrall, in Nether Providence, the wind was easterly till about 4 o'clock, when it suddenly shifted to the southwest at which time the heavy rain commenced and continued till five, or perhaps half past five o'clock. At about five o'clock, the wind blew from west northwest and with great violence. As observed by John C. Beatty, at his residence in the northwest corner of the township of Springfield, the heavy rain commenced between two and three o'clock in the afternoon, and continued till about five o'clock. The wind blew, but not violently, at his mills. There appeared to be a current of air, or whirlwind, that passed just above on the hill, which broke off trees and took some up by the roots. Lower down on the same creek with Mr. Beatty, it was remarked by Messrs. John & George Lewis, that in the direction of the wind, (although at no time violent) there was a circumstance very unusual. After it had been raining for some time, there appeared to be two storms of rain approaching at once--one from the southeast the other from the northwest, which appeared to meet about north from their place, and they could not tell for some minutes which would prevail, but eventually the one from the southeast carried the sway. There was a considerable increase of rain during the struggle, or [PAGE 13] soon after, but nothing at their mills to justify the height of the water which occurred. As observed by Joel Evans, at his residence in Springfield, and about a mile north from the Messrs. Lewis' but on much higher ground, the heaviest rain fell between five and six o'clock. The direction of the wind during the day, until the heavy fall of rain commenced, being generally from the southeast, though at some periods throughout the day it was variable, shifting from east-southeast, to south-southeast The atmosphere at a considerable height above the earth's surface, appeared to be in a very unsettled and agitated state, from 12 o'clock, M. to 5 o'clock P. M., which was indicated by contrary and opposite currents of wind prevailing, carrying with them light clouds, which he observed several times in the afternoon; he being induced to go out to make observations on the state of the weather, from its very unusual and threatening appearance. During the fall of the very heavy rain, and as nearly as he can recollect, about half past five o'clock, the wind suddenly commenced blowing with great force from the east, which soon increased to a violent gale, prostrating fences, and some trees in its course. Its velocity was such that with the immense quantity of water falling (which it carried with it in one continuous sheet, as it were), rendered it impossible to see a distance of more than fifty yards. After blowing in this way for fifteen or twenty minutes, the wind almost as suddenly veered to southwest (nearly the opposite point of the compass,) and for a short time (perhaps not more than from five to ten minutes) blew with equal violence, leveling in that direction on his farm, a number of panels of fence, and one or two apple trees. The wind subsided about six o'clock, or very soon after, and was succeeded by a calm. As observed by Professor John F. Frazer, of Philadelphia, who happened to be at the farm of Samuel West, in the upper end of Chester township, the heavy rain commenced late in the afternoon, about half past five or six o'clock, and continued perhaps half an hour or more. During the rain [PAGE 14] there was no wind, the streams (for it fell more in streams than in drops) were, apparently quite vertical. Professor F. was unprepared to measure the quantity of rain which fell, but it exceeded any thing which he had ever witnessed. From well authenticated information, which he received from the farm of Mrs. Grubb, in Brandywine Hundred, near the State line, he is perfectly satisfied that the fall of rain at that place exceeded ten inches in about two hours. The rain was much earlier at Mrs. Grubb's farm than at Mr. West's, commencing there about two o'clock. In the township of Bethel, not far from the line of the State of Delaware, a hurricane of great violence occurred about four or five o'clock in the afternoon. The wind blew from different points at different places in the same neighborhood, as is manifest from the position of uprooted trees, &c. A peach orchard belonging to Mr. Clayton, was blown down--the trees laying to the northeast. An apple orchard not very distant, lays prostrated toward the southeast. At John Larkin's, two miles north of Clayton's, the gale appears to have been most violent. The wind came from the southeast, and tore up a large quantity of heavy timber (said to be about two hundred cords) all in a narrow strip, not more than two hundred yards in width. A valley of woodland, bounded by pretty high hills, had nearly all of its timber blown down, and what is very remarkable, the trees are not generally laid lengthwise of the valley, but across it, with their tops towards the northeast, while on the adjacent hills but few trees were uprooted--one very large white oak, however, which was deeply and strongly rooted in a clay soil, was blown down. At a neighbour's, opposite to Mr. Larkin's, the wind blew from the south, laying several apple-trees due north. The gale left few if any traces, except in one neighborhood--say within the compass of three square miles. Indeed it does not appear to have been severe, except on a few detached farms. The above observations were communicated by John Keenan, who resides in that vicinity. As observed by another member of the committee at the Hall of the Institute, and on his road from that place to his residence in Upper Darby, the commencement of the heavy rain was about half past three o'clock, with the wind blowing from an easterly direction. At about a quarter before four o'clock, and while the rain was pouring down in torrents, the wind suddenly shifted round to the west, or southwest, and remained in that quarter until he arrived at home about five o'clock. The rain was not constantly violent. It would at times slack off for a very few minutes, and then commence again with redoubled violence. There appeared to be so much commotion in the clouds, as to render it difficult to determine from what quarter they came, but the manner in which the rain fell, impressed him forcibly with the idea at the time, that it proceeded from a rapid succession of gusts of fearful violence. The dark and lowering appearance of the clouds was very remarkable, and the rain continued to fall until about six o'clock, about which time, or later, the wind veered round to the southeast but it did not blow with much force at any time. It was observed by Dr. Joshua W. Ash, at his residence in Upper Darby, that at about three o'clock P. M. it began to rain heavily, and for the space of more than three hours, a succession of heavy showers occurred, marked by an unusual darkness of the atmosphere, and an unusual heaviness of the drifting clouds, which were at times observed to drag upon the tree tops. These appearances grew more marked as time wore on, until near 7 o'clock, when the clouds which had had a general direction from southwest to northeast now gave signs of much atmospheric commotion, crossing each other at irregular and opposite angles; but the prevailing direction appeared to be from the South and West--the wind suddenly shifting from southwest to east and northeast, where it remained some minutes, and then suddenly wheeled round again to the southwest. The residence of Dr. Ash is southeast of the district on [PAGE 16] which the very unusual rain fell. As accurately measured by him, but three and three-quarter inches fell during the day. Near 7 o'clock, one inch of this quantity fell in the short space of fifteen minutes. As observed by Dr. Caleb Ash, of Darby, the heavy rain commenced about half past five o'clock, and lasted till seven P. M. The direction of the wind at different periods of time during the day, varied from northeast by east to southeast, but at the time of the heavy rain it was southwest. It did not blow with violence, but was a stiff breeze. Dr. Ash had no means of measuring the quantity of rain that fell, but the floods of water which came down the surrounding hills was unusually great, causing the flats to have the appearance of pools. As observed by Enos Sharpless, at Waterville, a short distance north of Chester, it rained more or less the greater part of the day, moderately until about six o'clock, when there was a pretty heavy shower. He thinks there was little wind at any time. As observed by Caleb Pierce, of Chester, the commencement of the heavy rain was about quarter past five o'clock, P. M., and its continuance about half an hour. In the afternoon thunder was heard, which continued some time, though at a distance. At about three o'clock it became so dark as to render it difficult to read in the house without a light. In a north-west direction from this place, there was an appearance of the clouds or gusts meeting, and the rain pouring down at a distance, which appearance lasted for some time. At the commencement of the heavy rain, the wind was southeast, but during the heavy shower it came from the northwest. After the heavy shower, it boxed round the compass in the space of five minutes. As observed by Jonathan Dutton, at his mills in the northern part of Chester township, the heavy rain commenced about five o'clock, and terminated about half past six, P. M. The direction of the wind was northeast till about five o'clock, when it changed to west, and blew a smart gale, but not [PAGE 17] what he would consider a violent one. The quantity of rain which fell was not ascertained. As observed by James Riddle, at Avendale, about two and a half miles N. E. from Chester, the wind blew from the southward and eastward all day till the evening, when it blew a gale from the northwest. Very little rain fell during the whole day till evening, when there was a smart shower, but nothing of any amount to make a rise in the creek. A gentleman residing in Concord township, informed Mr. Riddle that the wind changed at least five times, according to his own observations, in that township. As observed by Robert Frame, Esq., at his residence in the township of Birmingham, the rain commenced about noon, the wind in the east or southeast. The clouds were dark and heavy, the lightning sharp, and the thunder tremendously heavy, accompanied with a rumbling noise in the air. The wind blew hard and was whiffling, and the rain fell in torrents till two, or perhaps half past two o'clock, when it subsided for ten or fifteen minutes, after which--the wind in the west, or southwest,--the clouds appeared to discharge their contents with redoubled fury. The rain ceased about four o'clock, P. M.
Mr. Joseph Edwards, who resides in Middletown township, within half a mile of the centre of the county, observed a phenomenon during the last heavy shower of rain, which does not appear to have been noticed in any other part of the county. He remarks that during the last shower which continued, say twenty minutes, and in which there fell a greater quantity of water than during any equal space of time during the afternoon--unlike any other shower he had witnessed--the distant woods and other objects were not obscured in any sensible degree by the falling rain. This extraordinary appearance was a subject of remark by all present, and created considerable surprise. At the time there was an impending mass of dense clouds, without any apparent [PAGE 18] [PAGE 18] motion in the air. This particular shower approached from the south, unaccompanied by wind. The foregoing embraces all the observations made on the storm in Delaware county, which have been communicated to the committee. On the evening of the same day, a very violent gale passed over the extreme western part of the city of Philadelphia, in a northern, or northwestern direction. In its course, it unroofed a part of the gas works; prostrated trees; overturned the railing on the eastern abutment of the Permanent bridge; carried many boards, &c., from a lumber yard in that vicinity, to a considerable. distance, besides causing other damage. This gale appears to have been accompanied with considerable rain which extended higher up the Schuylkill river. This does not appear to have been the case in a southward direction from the city, as at Fort Mifflin in the Delaware, a little below the mouth of the Schuylkill, but two and three quarter inches of rain fell, as accurately measured by a rain gauge kept at that place. The hurricane which has been described as occurring in Bethel township, appears to have extended into Brandywine Hundred, in the State of Delaware. It proceeded here in a narrow vein, not more than one-eighth of a mile in width, prostrating forest and fruit trees and fences in every direction, and causing considerable damage to buildings. The barn of Uriel Pierce was blown down, and the roof of George Miller's dwelling was blown off, and carried to a considerable distance; a bed, bed clothes and wearing apparel were carried by the wind from Mr. Miller's house, a distance of nearly a mile. The most remarkable circumstance connected with the rise in the waters of the several streams, was its extreme suddenness. In this particular, the present flood probably has but [PAGE 19] few parallels on record; occurring in a temperate climate, and being the result of rain alone. The description given by many persons of its approach in the lower districts of the county, forcibly reminds one of the accounts he has read of the advance of the tides in the bay of Fundy, and other places where they attain a great height. Some speak of the water as coming down in a breast of several feet at a time; others describe it as approaching in waves which followed each other in rapid succession; but all agree that at one period of the flood, there was an almost instantaneous rise in the water of from five to eight or ten feet. The time at which this extreme rapidity in the rise of the water occurred, was (in most cases) after the streams had become so much swollen as to nearly or quite fill their ordinary channels. The quantity of water required to produce such a phenomenon, was therefore immensely greater, as the valleys of the streams in most places have a transverse section of several hundred feet. The breaking of mill dams, and the yielding of bridges and other obstructions, no doubt contributed in a degree to produce such an extraordinary swell, but we must mainly look for the cause of this sudden rush of waters, to the violence of the rain, if the term rain will apply to the torrents of water which fell in the northern and western sections of the county. The rapidity in the fall of the water after the flood had obtained its maximum height, corresponded in a measure with its rise. Chester creek at Flower's mill, was observed to fall ten feet in fifty minutes, or at the rate of one foot in five minutes. Though not so accurately observed, it is probable the other streams fell at a corresponding rate. At the earliest dawn on the following morning, the streams had retired within their ordinary beds, scarcely presenting miniature pictures of the mighty torrents which had swept through their valleys on the preceding evening. Commencing on the eastern border of the county, the effects of the flood in the several large streams will be [PAGE 20] particularly noticed, in the order that they occur in proceeding westward. It has been before observed that the flood in this stream did not rise to an unusual height. It is only adverted to at all as a matter of contrast, and for the purpose of defining the eastern border of the district of country upon which the greatest force of the rain storm was expended. At Seller's mill, on the West Chester road, this stream only attained the height of six feet and half, and at the head of tide water it did not reach the height of previous floods, by two feet. Nailor's [Naylor's] run, its principal tributary, was raised about in an equal degree. Near the sources of both these streams, in the township of Haverford, the rain fell with considerable violence for some time. At Haverford School, which is within the drainage of Cobb's creek, 5.82 inches of rain fell, as accurately measured by a rain gauge kept at that institution. The contrast between the flood in Cobbs and Darby creeks was very striking at the head of tide water, where they approach each other within less than a mile. At the time the latter had risen to a height of about seventeen feet and swept every thing before it, the former presented nothing beyond an ordinary freshet. Proceeding westward, this is the first large stream which properly comes within the scope of the present inquiry. Ithen [Ithan] creek, one of its principal branches, attained a height never before witnessed by the oldest inhabitants, and was the cause of considerable destruction of property. The bridge over this stream where it is crossed by the old Lancaster road, near Radnor Friends' Meeting house, was carried away, This was a stone bridge with a single arch of twenty-five feet span, and its location within about two miles of the head waters of the creek. Even here the volume of water was so great that in forcing itself through the aperture presented by the arch, the abutments were undermined to such an extent as to cause the bridge to fall. The mill dam of [PAGE 21] Jesse Brooke, a short distance below, was partly carried a way, and that of John Evans, still lower down the stream, entirely swept out. Mr. E. also had a large quantity of lumber carried away, and sustained other losses. With the exception of fences, crops, &c., no serious damage was sustained on what is called the eastern branch of Darby creek, above its union with the west branch. Its waters were raised, however, to an unprecedented height. Some damage resulted from the flood on the west branch of this stream, before it enters Delaware county. Thomas' mill dam, a short distance above the county line, it is understood, was entirely swept a way. At the bridge near Mr. William Crossley's factory, the water attained a height of ten feet, and but for the flat around the northeast abutment, the bridge must have yielded to the force of the flood. As it was, the bridge, although wholly constructed of stone, was observed to oscillate so perceptibly as to alarm a number of bystanders for its safety. Mr. Crossley sustained some loss from having the basement of his factory flooded. Samuel Moore & Co., who own and occupy two woollen factories, next below Mr. Crossley's had both their dams destroyed. The small dam on this stream, which turns its waters into the main dam belonging to 1Levi Lewis' mill, is also said to have been broken, as well as the side bank of the main dam itself. The saw-mill dam of Mr. Lewis, which is on a tributary that empties into Darby creek, a short distance below his flour mill, was also broken. From Mr. Lewis' mills to a point near Hood's bridge, the creek has ample room to spread, and was productive of little damage, except to fences, &c. Near this point the water rose to the height of fourteen feet, being seven feet higher than the ice freshet of January 26th, 1839. Hood's bridge, which was a stone structure of two twenty feet arches, erected in 1836, at a cost of $1,553 to the county, had both arches swept out, and the abutments nearly destroyed. It may be regarded as a total loss. After leaving this bridge, the creek has wide flats to the [PAGE 22] [PAGE 22] point where it is joined by Ithen creek, and for a short distance below. Near Wright's saw-mill, where the creek had room to spread several hundred feet, the flood only attained a height of nine feet four inches. The mill dam and race of Clement & William P. Lawrence was considerably injured-the saw-mill damaged to some extent, and lumber belonging to several persons was carried away. These mills are located at the point where the creek is crossed by the West Chester road. More than one hundred feet of the western wing walls and filling of the stone bridge at this place were swept away to the foundations, and the abutments considerably undermined. At this point on the creek, both above and below the bridge, the flood attained a height of thirteen feet nine inches, and was at its greatest height at a quarter before 8 o'clock. At Joseph B. Leedom's flour and saw-mill, but little damage was sustained, they being located on a curve of the valley of the creek, which saved them from the force of the current. At this point the water rose to a height of thirteen feet two inches. The stone bridge, a short distance below Leedom's mills, had a large proportion of its guard walls swept off. The flood attained a height of fifteen feet at this place, with a cross section of eighty yards, which with proper allowances, would give an area of two thousand eight hundred square feet. The next bridge below, near William W. Clement's, which is built on the lattice plan, in consequence of being located on a western curve of the creek, with a flat of more than seven hundred and fifty feet at its eastern end, sustained no injury. In fact the bridge was not subjected to the least danger from drifting timber, &c., as the current of the flood ceased to pass near the ordinary channel of the creek, long before it attained its maximum height. About a fourth of a mile below this bridge, near the foot of E. Levis' meadow, the flood reached the height of fourteen feet six inches. A few hundred yards below this point, in the timber land of N. Garrett, deceased, it attained a height of seventeen feet, being six feet six inches higher than the [PAGE 23] ice freshet of 1839. This sudden change in the height of the water in so short a distance, must have been altogether owing to the obstruction caused by the thick growth of young timber, as at Palmer & Marker's mill, half a mile below, the water only attained a height of fourteen feet--the width of the valley of the creek being about alike in both places. But slight damage was sustained at the woolen factory owned by Oborn Levis, and occupied by Moses Hey. The lower story was flooded, and the machinery somewhat injured. Next below is Palmer & Marker's paper mill, which exhibits the destructive power of the flood in a very striking manner. Thirty feet of this mill was washed down, and the balance much shattered, a paper machine ruined, and their race and dam considerably injured. Upon the site of a very productive garden, there is nothing now to be seen but rocks denuded of every particle of earth, while a few yards below, a deposit of stone, &c., covers three-fourths of an acre. Mr. Oborn Levis' dam was swept out entirely--his race broken in some places, and filled with stones and gravel in others. The sizing-house attached to his paper mill, was swept away to the foundation, and the basement story of the main building with its contents, was greatly damaged by the flood bursting through the door and windows on one side of the building, and passing out at the same avenues on the other side. Opposite to this mill, on the eastern side of the creek, were a number of gardens belonging to the workmen. Scarcely a vestige of vegetation is now left to mark their site, and over a considerable portion of it, nothing is to be seen, but a bed of rocks. The next improvements below, are on the estate of Thomas Garrett, deceased, and it was here where the flood, in this creek, proved the most destructive to private property. A small cotton factory on these premises, occupied by John and Thomas Kent, with its entire contents of machinery, stock in trade, &c., was swept away; an unoccupied dwelling was so completely carried away, that no part of it remains to mark the site upon which it stood. The large dam on this [PAGE 24] property was swept away, and also a considerable portion of the race, and several private bridges. Three stone dwellings were partly carried away, and rendered complete wrecks. At the large factory occupied by Dennis & Charles Kelly, the stone picker house, with its contents, was swept off, and the basement story of the main building flooded. The flood attained a height of sixteen and a half feet on these premises, and was at its greatest height at about a quarter past eight o'clock. D. & C. Kelly also occupy the next mill property, which is a large cotton factory belonging to the estate of Asher Lobb, deceased. Their dam was carried away, the race injured, and the lower story of the factory (used as a weaving room) flooded, and one dwelling house carried away, causing the loss of five lives. The particulars of this catastrophe will be detailed in another part of this report. The western wing-walls of the bridge at this place with the filling, were nearly all swept away, and two of the three arches greatly injured. The height of the flood at this place was fourteen feet, and the time of its greatest height, half past eight o'clock. The dam of Matthew's paper mill was washed out to the foundation, and a part of the race bank carried a way. The flood passed with violence through every aperture in the lower story of the mill, doing great damage to the machinery and stock on hand. The water rose to the height of fifteen feet at this mill. Bonsall's mill dam and race were considerably injured. The water was sixteen feet high in their flour mill. Thomas Steel's dam, which is the last on the creek, was carried away to the foundation, and his stable and cotton house were removed. His mill was much flooded, the water rising to the height of seventeen and a half feet, which is the greatest height reached by the flood in Darby creek, and five and a half feet higher than any flood recollected. The stone bridge at Darby, which reached across the entire valley of the creek and which was built at a cost to the county of [PAGE 25] $11,000, had its three arches entirely swept out. These arches would probably have been insufficient to pass one half of the water of this flood. Thomas Glascoe's dwelling and furniture were greatly injured, as was also the furniture of other persons in houses belonging to him. The artificial banks of the creek below were broken in several places, and a quantity of hay carried off. Above Garrett's but few trees were uprooted by the flood, but below that place, a number of considerable size yielded to the force of the current. None of the tributaries of this creek, which empty within four miles of tide, were flooded in a very extraordinary manner. Those above were raised higher than ever before witnessed, and several of them were productive of considerable damage in the destruction of culverts, fences, &c., and by the deposition of large stones, gravel and sand upon meadows. It will be perceived that Darby creek has a less descent than either Crum, Ridley, or Chester. It may also be observed, that the hills which border it are not quite so high, and in general it has a wider valley than either of those streams, though ill some places it is closely approached by the hills, particularly in the district where the greatest amount of damage was sustained. Proceeding westward, this is the next of the large inundated creeks. The flood ill this stream attained a greater height than ill Darby creek--was productive of much damage to bridges and private property, but was unaccompanied with any loss of human life. Except to fences, &c., the flood in Crum creek evinced but little of its destructive force, before entering the borders of Delaware county. Immediately below the Chester county line, at the factory of Jonathan N. Hatch, an unoccupied frame tenement was carried away. The extensive stone bridge at the West Chester, or Strasburg road, which was built at au expense to the county of $10,O00, and which had a water way of thirty-two feet, had its arch [PAGE 26] completely swept out, one of its abutments undermined, and thirty feet of each end of the wing-walls carried away. Immediately below the point where the road from Newtown Square crosses the creek, the flood reached the height of nine feet upon a cross section at the surface of three hundred and thirty feet. The saw mill of Adam B. and Enos Williamson, and S. Bishop, with the appurtenances was damaged to some extent. The stone arched bridge, near this place, known as "Howard's bridge," was almost wholly destroyed. It may be regarded as a total loss. The next bridge below, near Bartram's, a sleeper bridge, was entirely swept away. The next point at which the flood exhibited any degree of violence, was at T. Chalkley Palmer's mills. Mr. Palmer's flour mill stands immediately at the breast of the dam. Between the mill and the high ground on the west side of the creek, there was a very wide and strong embankment. This embankment was carried away, and an extensive excavation made below to the depth of twelve feet. Immediately facing this embankment stood a large stone wagon house which was fifty feet in length--this building was entirely carried away, with a considerable part of its contents, including a quantity of hay. The wood work of the sleeper bridge at this place was carried off, and the abutments injured. The water near Mr. Palmer's mill rose to the height of twelve feet. The branch of Crum creek which joins it some distance below this point, and upon which Willet Paxson's saw-mill is located, was very high and turbulent, and caused considerable damage. Mr. Paxson's saw-mill dam was swept out. "At about five o'clock, P. M., the creek began to rise, when several of the workmen, with myself, went to the shop to secure some timber which was afloat and likely to be washed away; but we had not time to make any thing safe, before we were obliged to make our escape, which, if we had not done at the time we did, we must have been washed with the mills down the creek. The water in the space of ten minutes, rose, I think, seven or eight feet. The bridge was the first that went--it seemed to fall over as if there was no strength in it--then my wood-house, with about ten cords of wood and a lot of chestnut rails. Next the head gates were bursted out, when the edge tool factory went down with a tremendous crash, and in an instant there was nothing to be seen but water in the place where it stood. The saw-mill was the next to yield to the violence of the flood, and all the logs, plank, boards, &c., near it were carried away. The walls of the plaster mill and finishing mill were undermined, and those in front fell out, leaving the back and end walls in such a wrecked condition, that they fell in a few days after. About half the race bank, and eight yards of the breast of the dam, were completely swept out. All the hammers, anvils, unfinished tools, coal, &c., were swept away, or covered with stones and dirt below." The water at this place rose to a height of about fourteen feet above its usual level. The paper mill of John Lewis is a short distance below Mr. Beatty's. Part of his dam was broken down, the head gates forced in, and considerable injury done to his machinery [PAGE 28] by being flooded. Opposite Joel Evan's farm, a short distance below the paper mill, the water rose twelve feet above its usual level. The bridge at the turnpike over the dam of George Lewis, was a roofed lattice bridge, with a span of ninety feet. It was nearly new and had been erected at an expense to the county of four thousand six hundred dollars. The wood work of this bridge was completely carried off. The mill dam of George Lewis was carried a way, as was also his dye house, a stone building of considerable size. His race was partly filled up, and the machinery in the mill considerably injured by being flooded. The water rose twenty feet above its usual level--seven feet higher than ever before noticed. The next establishments on the creek below, are the Strathaven and Avendale cotton factories, owned by William J. Leiper, and both occupied by James Riddle. Both dams were partially swept away, and a number of the tenant houses injured. All the tenant houses at Avendale were under water to the second story, but being constructed of stone, were not demolished. Mr. Riddle had a large quantity of cotton in bales, carried away, and a considerable amount of cotton goods, yarns, &c., damaged. Mr. Riddle observes, "that the water at this place rose nineteen feet--six feet higher than the great ice freshet of 1839. The rise in the creek commenced at about half past seven o'clock. The water rose very suddenly as well as very unexpectedly, and was at its highest point a little after eight o'clock." The county bridge at this place had its guard walls completely swept off and was otherwise greatly damaged, but the arches remained firm. A team of five horses, owned by Samuel Beard, was in the stable at Avendale, but so rapid was the rise in the water, that they were all drowned before they could be got out. Below this point the Hon. George G. Leiper sustained considerable loss in damage to his mill dams, breaches in his canal, and injury to private roads through his property-he [PAGE 29] also lost a horse from drowning. The sleeper bridge, near Mr. Leiper's, was carried away. Mr. L's. factories were not materially injured, and their occupants sustained but little loss from the flood. The location of the stone bridge at the post-road, being out of the current of the flood, sustained but little injury. A small portion of the western wing walls was carried away. The height of the flood in this creek, it will be seen, did not exceed that in Darby creek at corresponding points, until you reach Beatty's mills. Below that place it was an average about two feet higher. This is readily accounted for by the fact, that the very heavy rain was more protracted, and extended lower down the valley of Crum than of Darby creek. The flood in this creek caused some damage above the boundary line which separates this county from Chester, but nothing very material. Yarnall's mill dam, which is on a tributary, and within the borders of this county, was injured to some extent. The county bridge, known as "Russell's," on the main stream, sustained some damage. The first place on this creek, from which the committee have any very particular account of the flood, is on the farm of George Howard, in Edgmont. At this place the water attained a height of twelve feet six inches, which was six feet six inches higher than the great freshet of 1839, and six feet four inches higher than that of 1795; this last being the highest which had previously occurred at the same place, during a period of at least ninety years. Although the rise in the water of the present flood was about twice as great as that of 1795, the quantity of water which passed at a given time was greatly more than double. A cross section of the flood of '95 gives but nine hundred square feet, while that of 1843, gives upwards of two thousand five hundred square feet. By making a proper allowance for the accelerated velocity of the flood of 1843 over that of 1795, which would be necessarily incident to its increase of volume, it is rendered probable that more than three times as much water passed in a [PAGE 30] given time during the present freshet, as in that of 1795. The time of the greatest height of the water was half past six o'clock. The above information was furnished by James Howard. The first heavy loss of property on this stream, occurred at Amor Bishop's mills. His dam was entirely carried away, together with a part of the race--his mills, also, were considerably damaged. Two tenements which stood near the creek, with the furniture which they contained, were carried away, but no lives were endangered. The flood at this place reached its greatest height about six o'clock, and was ten and a half feet above usual low water. The abutments of the bridge at Bishop's were swept away, with the exception of barely enough of the face wall to support the wood work, which, singularly enough, remains in its original position, except the hand-railing, which shared the fate of the abutments. This was a sleeper bridge of one span--the abutments being founded on the solid rock. The abutment on the western side of the creek is so nearly carried away as to allow a portion of the stream at low water to flow where it stood--its facing stones alone being left to support the ends of the sleepers. These, with the planking, remained so firmly that they do not appear to have moved the fraction of an inch. While every thing was yielding around it, so firmly was this bridge held to its place, that during the height of the flood, large floating trees were observed to strike against it with great force--their roots being drawn under it, and their tops thrown many feet out of the water. The water, at its height near the margin of the stream, and 43 yards above the bridge, was ten feet six inches Its greatest height on the margin of the flood, [PAGE 31] opposite to the bridge, was two feet nine inches above the level of the floor of the bridge, while the water on the floor of the bridge was at least three feet six inches high. This shows that the water at the bridge, near the middle of the flood, was nine inches higher than at the margin. Forty yards below the bridge, on the margin of the stream, the water stood one foot lower than the level of the floor of the bridge. At forty-three yards above the bridge, on the margin of the flood, the water was three feet higher than the level of the floor of the bridge. The floor of the bridge is seven feet three inches above low water. The fall in the creek for 180 yards above the bridge is .16 of an inch to the yard, and for two hundred and 40 yards below the bridge, the fall is .12 of an inch to the yard. The width of the valley of the creek occupied by the flood at the bridge, is 64 yards. The width of the valley below the bridge, at the narrowest place at high water mark, is 86 yards, from which point the valley continues to widen for some distance below. From these measurements it would appear that the bridge occupied a position, below which the valley of the creek suddenly expanded, and consequently the same volume of water in passing down could not remain at the same elevation below as it did above the bridge, by nearly four feet, according to the foregoing data. It has been before stated, that 43 yards below the bridge, the high water mark on shore was one foot below the level of the bridge, and it was also stated, that the middle of the current, at the bridge, was nine inches higher than at the margin; but it is probable that in consequence of the valley becoming wider, the middle of the current, 43 yards below, would not stand so many inches above the height at the margin. There must, therefore, have been a great deficiency of water below the bridge to counterbalance that which was above and that which rested upon it. The length of the platform of the bridge is 36 feet, its breadth fourteen [PAGE 32] and a half feet, and the depth of water upon it three feet six inches, making 1827 cubic feet of water on the bridge, which is equal to about 50 tons. It is not to be supposed that the whole of this great weight was supported by the bridge, but it is manifest that a great portion of it was, and this will be a sufficient explanation of the extraordinary fact, that the timbers did not float off, and why they firmly held that portion of the abutments upon which they rested, in defiance of the drifting trees and lumber, which by their momentum acted against it like battering rams. Had not the bridge been fastened together, it no doubt would have been removed piece by piece. The bridge was originally built by private subscription, and was so maintained for a long time before it became a county bridge; it was one foot lower then than at present. During the whole time the sleepers merely rested on the walls without being secured with bolts or other fastening. The extraordinary preservation of the platform of the bridge certainly goes to show, that bridges in certain situations may with safety be erected so low as to permit high freshets to pass over them. Very large sized stones should be used in the masonry, particularly for coping, and in the construction of the exposed corners, and the timbers should be firmly secured to the abutments. The walls should in no place exceed the height of the roadway; and it would add to the security of the bridge to have the up-stream side of the platform lower than the down-stream side. All the woodwork of the bridge, near Edward Lewis' mills was carried away, and the abutments considerably injured. The valley of the creek at this place is very narrow. Mr. Lewis' paper mill stood in an exposed situation, and was, together with its contents, wholly swept off. The saw mill shared the same fate, although it was not so much exposed to the current. His flour mill was nearly destroyed, and much of its contents washed out. Between his mills and dwelling the flood passed with fearful velocity, and produced an [PAGE 33] excavation of great depth. The water at this place rose to the height of eighteen feet, and was at its greatest height about 6 o'clock. The next mill below is a woollen factory, owned by Charles Sherman, and occupied by E. Taylor. Their dam was partly destroyed, the head washed out, and the race considerably injured. Three dwellings were carried away, the mill itself much injured, and the machinery and goods in the lower story were either destroyed or greatly damaged. Greatest height of the water fourteen feet. The next mill in order is the woollen factory of Samuel Bancroft (formerly Ronalson's.) The flood attained a height of twenty feet, and was very destructive at this point. Fifty by thirty-six feet of the factory was entirely destroyed, with a large amount of machinery, and one thousand pounds of wool. Four dwellings were also nearly demolished, occasioning the loss of five lives. The water was at its greatest height at half past six o'clock. On a tributary of Ridley creek, in this neighborhood, the flour mill dam of Thomas Hutton was entirely swept away. At the paper mill of Park Shee, Esq., the breast of his dam and the mill itself were much injured. Two small buildings were destroyed. The water rose to the height of twenty feet. At Charles Sherman's lower factory (formerly Benninghoves,) occupied by E. Taylor, the dam was swept away, and the machine manufactory and picker house (one large building,) with all their valuable machinery, were washed down and destroyed. A quantity of wool and cotton were carried off, and the machinery and goods in the basement story of the mill were greatly damaged. The water rose fourteen feet, and was at its greatest height about 7 o'clock. The bridge between this mill and the rolling mill of J. G. Johnson was nearly destroyed, the wood work entirely carried off, and the abutments greatly damaged. The damage sustained by Mr. Johnson at his mills was, comparatively, not [PAGE 34] very serious. His buildings were injured, and a considerable quantity of iron damaged. At the mills of Enos Sharpless the water rose to the height of eighteen feet, being at its greatest height a little after eight o'clock. At this place the present flood was seven feet three inches higher than the great ice freshet of 1839, and eight feet three inches higher than the flood of 1795. The king post bridge, near these mills, was carried away, but as it was lodged within a mile, the materials were chiefly recovered, and the bridge rebuilt without great expense to the county. The counting house, a temporary bark house, and bath house were carried away. The basements of the mills were flooded, and the cards in the woolen mill, and the bolting cloths in the flour mill were damaged. The injury to Mr. Sharpless' dam was very considerable--about half of the breast-work, and nearly all of the filling above (constituting about three fourths of the entire dam,) were carried away. The fixtures for raising the logs into Crosby's dam were denm0lished, and a number of logs carried off. John M. Sharpless, at these same mills, had a Cooper shop, with casks, lumber, &c., carried away. The next bridge below was over Crosby's dam. It was of great length, reaching from hill to hill, constructed entirely of stone, and had been built at a heavy expense to the county. The arches of this bridge were completely swept out, and one abutment nearly destroyed. The loss to the county will necessarily be very heavy. At Peirce Crosby's mills the water, during the flood, was twenty-one feet high, which is the greatest height noticed on this creek, and seven feet higher than any previous flood recollected by any person living. A large portion of Mr. Crosby's dam was carried away, his race filled up, one tenement carried off, and his flour mill and saw mill partially injured. Edward R. Crosby had a quantity of logs and boards carried away. The bridge at this place was also carried off, but the loss to the county was not very great. Mr. Peirce Crosby observed, during the greatest height of the [PAGE 35] water, a very marked difference between the height of the margin of the flood and the middle of the current. He is of opinion that the difference in height did not fall much short of three feet. The eastern abutment of the king post bridge at the southern road, together with the superstructure was carried away. The rail-road bridge over this creek was greatly damaged-the extensive trussel work on the eastern shore being swept off. The flood appears to have attained rather a greater elevation in this creek than in Crum. The destruction which was caused by it (without including the loss of life,) was infinitely greater. The number of trees which was uprooted and carried down was very considerable, and many of them of a large size. We have now arrived at the most westward of the large inundated creeks. In this stream the flood attained its maximum height, and greatly exceeded that in either of the foregoing streams in force and velocity, and in the destruction of property. The same number of lives were lost upon this creek as upon Darby creek. In the brief topographical view which was given of the county, it is mentioned that Chester creek has its origin by two principal branches termed "East" and "West," but so violent was the fall of rain in this region of the county, that our observations in tracing the flood will have to be extended to some of the subdivisions of these branches. On the principal division of the east branch, no serious damage occurred, except to fences, crops, &c., above the rolling mill and nail factory of John Edwards, Esq., deceased, both of which were unoccupied. On this property the dam was swept out and the race broken. The next establishment on this stream below, is the flour and paper mills of James M. Wilcox, Esq. His dam was injured and an. extensive protection wall at the end of his mill washed down. The injury done to Abraham Sharpless' saw mill, if any, has not been ascertained. [PAGE 36] The tilt mill belonging to the heirs of Thomas Thatcher, deceased, was wholly carried away--nothing being left but the tilt hammer and the grindstone. Grubb's bridge, on the State road, was considerably injured. This bridge was built in 1840, at a cost to the county of $1,666 dollars. The damage will amount to about one fifth of the original cost. The next mill property on this stream is a cotton factory belonging to the trustee of Hannah S. Hill, and occupied by Daniel Lamott & Son. The water was at its highest point about six o'clock, and had risen eighteen feet above its ordinary level. The Messrs. Lamott sustained a heavy loss in goods, yarns, &c. The county bridge at this place was so nearly destroyed that it may be set down as a total loss. The damage to the real estate was also very considerable, the dam and the race being swept away. The next mill below, near the junction of the two main branches of the creek, is a large cotton factory belonging to the same estate. It was unoccupied at the time. Here the damage was also very considerable. The dam was injured, the forebay swept out, and the water-wheel was thrown out of its position. 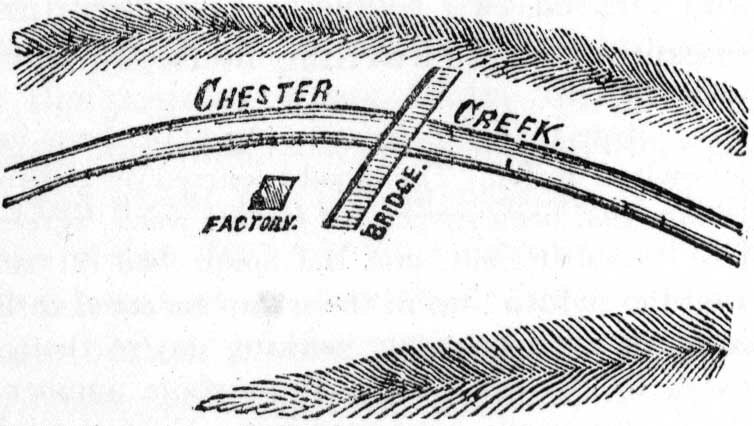 On Rocky run, or Martin's run, a tributary of this main East branch of Chester creek, David Green's cotton factory was considerably injured. The mill was stone, one story-the balance frame. A large part of this stone work was undermined, and has given way; but enough has remained firm to support the frame-work above. Mr. Green's dam was swept out, although located within a mile of the source of the stream. On this stream, the next mill below, is the flour mill of Humphrey Yearsley. His dam was broken, and his property otherwise injured. The saw mill dam of Joseph Pennel, the last on this tributary, was also broken. Ninety feet of an earthen embankment was carried away. Commencing on what may be termed the main West [PAGE 37] branch of Chester creek, the first mill property in Delaware county belongs to Caleb Brinton. It is occupied as a grist mill, saw mill and clover mill. His dam was broken, and his race considerably injured. The next mill below, is the flour mill of Matthew Ash. His dam was also broken, and his race partly filled up. His loss, however, was not very heavy. Casper W. Sharpless, Esq., had his saw mill dam entirely swept out, and his flour mill dams broken. The water, near the flour mill of Mr. Sharpless, rose to the height of ten feet above the usual level. At Jesse Myers' saw mill, which is upon a south westerly branch of this stream, the water was seven feet eight inches upon a cross section of sixty yards, being three feet eight inches higher than ever before known. Next below the flour mill of Mr. Sharpless, is the cotton factory of Joseph M. Trimble. His dam was broken and his race partly filled. The paper mill of James M. Wilcox, Esq., is the next below. A quantity of paper was lost from this mill; his dam was broken, and his race injured. A building which contained a large quantity of paper was removed several feet, but was not carried away. Proceeding down the main stream, we must arrive at the mills of James S. Tyson. At this place the flood exhibited its transporting and destructive powers in no slight degree. Mr. Tyson's dam and race were swept out, and a dwelling house occupied by a Mr. Kenworthy was entirely carried away, together with much of his household goods. The family, on the approach of danger, had removed to a place of safety. The county bridge at this place was completely carried away. The altered appearance of the valley of the creek in this vicinity is very great. About one mile below Mr. Tyson's mills is John P. Crozer's "West Branch" cotton factory, which is within about three eighths of a mile of the junction of the East and West branches of the creek, near which point, at Crozerville, Mr. Crozer has another Cotton factory, also propelled by the waters of the West branch. Upon these premises the power of the [PAGE 38] flood was expended with the most terrific violence. In an hour after the commencement of the heavy rain, both the East and West forks were observed to rise rapidly--the east fork at first rose more rapidly of the two, but subsequently the West branch swelled greatly the higher: the comparative volume of these two streams in their natural flow, is about as three to two--the East branch being the larger. Shortly after four o'clock, Mr. Crozer sent his son to the West Branch mill to order some precautionary measures, as he foresaw the approach of an unusual freshet. So rapid was the rise in the water, that soon after young Mr. Crozer had crossed the bridge, its wood-work floated off. When he reached the West branch mill, he found the workmen already engaged in removing goods from the lower to the upper story of the warehouse--to what little purpose will soon appear. At a quarter before five o'clock, the West branch dam (a pond of nearly ten acres surface) gave way, and at five o'clock the warehouse, a large stone building, containing many thousand dollars worth of goods and yarns, began to yield to the current. That side of the wall next to the central current began to knock out, stone by stone, and in a few minutes, the roof and the entire building went with a fearful crash, sending up a volume of dust from the mortared wall, so as to induce those present to suppose the building was on fire. About the same time, or soon afterward, the water wheel, mill gearing, dye house and size house, with their contents floated down, and were soon crushed to pieces: the water wheel shaft was afterwards found two miles below, but nothing else of value was recovered. Next in order the northern wing of the West branch factory, a three story building forty-eight by thirty feet, began to fall, and with its valuable contents of over eighty power looms and much other machinery, with goods, yarns, &c., soon disappeared. The sweeping ruin was not yet over: the centre building had one entire corner carried out to its foundation, which caused the floors to hang over, under their ponderous weight of machinery. [PAGE 39] The work of destruction was now nearly completed, and the people looked on with momentary expectation of seeing the whole factory fall, but in this critical and wrecked condition it remained. The machinery was much injured--some of it swept off, but the building has since been repaired, and is now in operation. When the waters had subsided, the place exhibited an altered appearance. A grove near the dwelling of Mr. Crozer, but on the opposite side of the stream, was entirely stripped of its trees, and as a substitute for the green sward upon which they grew, the whole surface remains covered with rocks, stone and gravel; while on the opposite side of the stream, and below the house and Crozerville factory, the green flat is enveloped in a deposit of mud several inches in depth. This latter deposit is made just above the junction of the two branches. The waters of the West branch flowing down in mad haste, backed up the valley of the East branch. It appeared to form a water bulwark, which caused the latter stream to move at this place, with much less impetuosity, and hence the deposit of mud. The rise of the waters of the West branch fork was twenty-three feet, and fully ten feet higher than the great ice freshet of 1839. The time of its greatest height at West branch mill, was about half past five o'clock. Soon after this time the flood began to subside, and fell rapidly. The bridge at Crozerville was entirely carried off--the abutments being razed to their foundation. Crozerville spinning mill was flooded and the machinery in the lower story a good deal injured--the cotton house, with about thirty bales of cotton , together with property of less value, was swept away. Opposite to this factory the channel of the creek was completely filled with rocks, stones, and gravel, and the stream, after the flood had subsided was obliged to find its way downwards through the tail race of the mill. Upon Green's creek, a stream putting into the main West branch from the south, and emptying into it above Mr. Tyson's mills, the flood attained an extraordinary height, and [PAGE 40] exhibited great force in uprooting and transporting trees, excavating the soil, &c. It is probable that fully as much rain fell in the valley of this stream, as in any other section of the county of equal extent. The dam and part of the race of Samuel F. Peters' near the mouth of this creek, were swept out, and his property otherwise injured. The water was eight inches on the roof of his saw-mill, and attained a height of 20.5 feet, being eight feet three inches higher than the ice freshet of 1839. Below the junction of the two main branches of the creek, the flood swept along with increased force and violence. Trees of a large size were uprooted, and carried down; rocks of great weight were removed from the places where they had quietly reposed for ages; beautiful green meadows and gardens were divested of every particle of soil, or covered with heavy deposits of rocks, stones, gravel, and sand, while the wrecks of buildings floating from above aided in the destruction of those upon the united stream. The dam and race bank of Samuel Riddle's cotton factory (the first on the united stream) were carried away, together with an old mill; and his machinery was considerably injured. Mr. Riddle's establishment is at Pennsgrove. At this place the flood reached the height of twenty-three feet ten inches above the usual level of the stream, and was at its greatest height about six o'clock. George Peterson, the owner of two double stone houses, situated on the margin of the stream, near Pennsgrove, was a heavy sufferer in proportion to the value of his property. One of the double houses was swept away, and the other occupied by himself, much wrecked, and the furniture washed out, and mostly carried off. In the same vicinity, four small tenements owned by John Rhodes, and occupied by himself, Joseph Drake, Thomas McGuigan, Mrs. Morton, and Mrs. McClese, were, with all the household goods which they contained, swept off, leaving no trace of a building upon the site where they stood, and causing the loss of six lives, the particulars concerning which will be given in [PAGE 41] another place. A stone house, the property of E. Churchman, standing near the four above mentioned, was very much damaged. The county bridge at Pennsgrove, except the piers, was carried away. Shortly before the flood, the county had expended about four hundred dollars in repairs upon this bridge. Below this, at Rockdale, Richard S. Smith had two dams carried away, and also a block of four stone dwellings, which at the time were unoccupied. At Knowlton, the flood attained its greatest height, and exhibited its most destructive powers. The Knowlton mill, a beautiful three story stone factory, 76 feet by 36, and filled with power looms, all new, and of the best construction, together with all the apparatus and arrangements of a complete weaving establishment, was swept to its foundation, and carried away, and with it a large amount of stock in yarns and goods. A frame mill at the same place, also owned by Mr. Crozer, and occupied by James Dixon (the machinery being owned by him) was carried down the stream: not a vestige of it remaining. The loss to James Dixon was total and ruinous, stripping him of all he possessed. The water at Knowlton attained a height of about thirty-three feet. This most extraordinary rise was in part attributable to local causes. The county bridge at this place is located just above the site of the factory, on a curve of the stream, as in the annexed diagram, and although it has three arches of the usual span, it does not afford a sufficient vent for the water in time of a heavy freshet; and at the present one, the passages became early obstructed with drift wood, and the arches quite choked up, so that the bridge which is more than twenty feet high, formed a dam across [PAGE 42] the channel of the stream, and turned the whole body of the current against the factories. These factories stood in a contracted valley or pass, between high banks--the bridge occupying two-thirds of its entire width. Thus but a small space was left to vent the swollen stream, until it rose so high as to pass over the top of the bridge. Had the bridge given way early, in all probability the factories would have remained. As it was, the large factory did not sink until the water had reached its highest point, and had begun to fall. When the large factory went down, the roof remained entire while in view of those who witnessed its fall, the undulations of the current being sufficient to cause the factory bell in the cupola to toll the knell of its own sad catastrophe. * [* More than fifty persons, most of them females, were employed at Knowlton mills. The flood occurred on Saturday afternoon, after operations had been suspended for the week, agreeably to the regulations of that establishment, and the hands had all retired to their dwellings. Had the sudden rise in the water occurred earlier in the day, or had it occurred upon any other working day of the week, scarcely a doubt can exist, but that the lives of the whole number of persons employed in the factory would have been lost. Even if time had been afforded them to escape from the factory, the substantial character of the building would have prevented them from doubting the security of their situation, until every possible chance of retreat had been cut off.] The bridge at this place was completely stripped of its guard-walls, but the arches remain standing. The flood proceeded onward with uncurbed fury, uprooting and carrying with it trees of a large size, and almost every thing else within the scope of its resistless current. The flour mill of J. & I.P. Button, which had stood the better part of a century, was wholly carried away, with its valuable contents of grain, &c. Their saw-mill, barn, and wagon-house, with their contents, also shared the same fate. Their dam was partly carried away, and their race considerably injured. The flood passed through their dwelling house, and cleared two rooms of their furniture. In fact, with the exception of the dwelling house, this property was nearly left [PAGE 43] in a state of nature; presenting even a more wild appearance than it could have exhibited before the first improvement was erected upon it. The county bridge at Button's was almost wholly carried away, leaving nothing but one damaged abutment, and a very small portion of the other remaining. The greatest height of the flood at this place, was thirty feet six inches, as given by Mr. Jonathan Button, and the time of its greatest height about seven o'clock. By a series of measurements made near these mills, by Professor John F. Frazer (who happened to be at the farm of Samuel West, a mile below, at the time of the flood) the cross section of the flood was found to be about seven thousand square feet. The point at which Prof. Frazer made the above measurements the flood attained a height of 25.16 feet--the creek being flush of water at the time. Professor Frazer made a very accurate measurement of the flood on the farm of Mr. West. The following particulars in relation to which are extracted from a letter which that gentleman had the kindness to send in answer to the circular of the committee. "The height of the flood I measured with as much accuracy as my means would permit, and am confident that my measures are correct within one or two inches, at the same time I must observe that the elevations are taken above the level of the creek, a day or two after the flood, when from the continuance of wet weather, the creek was still above its ordinary level; how much it is impossible for me to say. At the position where I first measured it, (upon Mr. West's upper meadow) the creek was about sixty feet wide, and averaged about six feet in depth, (it is the upper end of the back water from Flower's dam). The vertical height of the flood was 20.58 feet above the water line, or 26.5 feet above the bottom of the channel of the creek. The breadth of the water line at the highest point of the flood (measured at right angles to the direction of the creek) was 534.8 feet, (say 535 feet). The meadows overflowed, on either side, are quite flat, and appear to have been at some [PAGE 44] former time, the banks of the stream or current, so that, I think we may assume the area of the cross section as at least two-thirds of the rectangular area given by multiplying the breadth by the height. Assuming then the numbers 535 and 21 as representing these (neglecting the channel actually occupied by the creek) we shall have the area of the cross section 7490 square feet. Assuming the creek to be 60 feet wide and six feet deep, and its cross section a rectangle (as it is very nearly) we have an area of 360 square feet for the creek at its ordinary high water, by which we see that the cross section was increased twenty times. The increase of velocity I had no means of ascertaining, as the greater breadth at this point gave rise to the formation of extensive eddies." It was not intended by the foregoing comparison between the cross section of the flood and that of the creek, to establish any proportion between the quantities of water which passed in a given time, during ordinary low water, and at the time of the flood. The measurements were made at the head of a dam, and during a time of flush water; besides it is probable that the velocity was ten times greater during the flood than at the ordinary stage of the stream. Professor Frazer is of opinion that at Mr. West's (judging from the motion of the cotton bales) the velocity of the middle of the stream was not less than from fifteen to twenty miles per hour. At the farm of Mr. West, the creek makes a westerly curve, and the race from Flower's dam is taken out and carried down near the foot of the slope on the east side of the valley of the creek. The space between the creek and the upper end of the race was covered with standing trees. Some of the trees in this grove were uprooted or broken off, but the bulk of them remained firm, and formed a general lodgment for floating materials from above. About one hundred trees of various sizes brought down the current, found a resting place on this small piece of ground, besides timber from the wrecks of buildings, together with broken furniture, and parts [PAGE 45] of machinery in immense quantities. The trunks of some of the largest trees lodged at this place, measured two feet six inches in diameter. We are informed by Professor Frazer, that at Flower's mill, the flood attained its greatest height at eight o'clock and forty minutes, a point ascertained with some accuracy, while watching with serious anxiety an opportunity of rescuing Mr. William G. Flower. Mr. Flower was rescued at half past nine o'clock, at which time the flood had fallen ten feet. The flour mill and saw-mill belonging to the estate of Richard Flower, deceased, were both considerably injured--the latter removed from its former location. The lattice bridge near these mills, built but a few years since at a heavy expense to the county, was carried away, and both of the abutments injured. The railroad bridge at Chester, was carried off, together with an extensive portion of the embankment, on the western side of the creek. This bridge bent sidewise, nearly its whole width, before the ends were carried from the abutments. The chain suspension bridge at Chester, was also carried away. It did not yield, however, until it had resisted the force of the current, and the battering of drifting trees and timber, for a long time. The western abutment was razed to its foundation, and swept away, and the earth was torn up several feet below the foundations of the wing-walls. The eastern abutment was also injured. The damage done to private property by the flood in the borough of Chester, was also very considerable. Samuel Lytle had a fine row of basket willows uprooted and carried away, also his crane for loading large stone from his quarries. Captain Pierson's wharf was partly carried away, as was also that belonging to the estate of Captain John Hart. J.P. & W. Eyre had their storehouse injured, their crane carried a way, and about two hundred tons of coal swept from their wharf. William Eyre, Jr. had his stock of lumber floated off, and his new wharf greatly injured. The store of Jesse M. Eyre was badly flooded. [PAGE 46] William Kerlin had his stone kitchen, and several out buildings with their contents, carried away, the main building injured, and the furniture in the basement destroyed. William Kerlin, Jr. had a frame house carried off and entirely destroyed, as was also the slaughter house of William McCafferty, deceased. William Brobson's tan yard was much injured; his lime house was carried off, and his loss in hides and bark was very considerable. William Benton, who occupied the house of William Kerlin, Jr. had all his household goods, dearborn, cart, &c., carried off. Mrs. Mary Engle's sheds and stables, occupied by Maurice W. Deshong, were much damaged. The pattern house connected with the foundry of Jacob G. Kitts was carried away, together with nearly his whole stock of valuable patterns. Agricultural interests suffered severely along Chester creek and its tributaries. The meadows and flats were every where stripped of their fences. Few of these flats were under tillage, consequently the losses in crops, except grass, were not very great, but in some places whole acres present deep deposits of sand and gravel, and in others the surface is deeply excavated, or covered with rocks and stones, and rendered wholly unfit for culture, or even for pasturage. Joseph Griffith, Richard Dutton, Isaac Morgan, Nathan Suplee, Robert McCay, John Slaughter, and Aaron Wood are among this class of sufferers. It will now be seen that the flood in Chester creek was much higher than in either of the other large streams. This increased swell evidently depended on the immense quantity of rain which fell in a short time, within the drainage of its more westerly branches, as the water in the main East branch was not higher a short distance above its junction with the West branch, than Ridley creek, at a corresponding point. It will also be seen, that the damage to private property was immensely greater than upon either of the other large streams. It has already been observed that the Brandywine was not much raised. One of its tributaries, however, partly within the borders of this county, was raised to an inordinate height, and was productive of considerable damage. This stream is called Beaver creek, and in its course crosses the circular line which divides this county from the state of Delaware more than once. The first mill on it is a saw-mill belonging to Reece Perkins--his dam was broken, and his race was injured, but his loss was not heavy. The next mill below was in the state of Delaware. It was a stone woollen factory, owned by Charles Dupont, and occupied by Lewis Sachriste. So much of this factory building was washed down, that it may be considered as a total loss. The dam, which was very large, was entirely swept out, and all the machinery, stock, &c., in the mill, was washed out, and carried off. The loss to Messrs. Dupont & Sachriste, was very heavy. The meadow of Nathaniel Newlin, below this dam, was damaged to the amount of two hundred dollars. Next below, the dam of Philip Hizer's woollen factory was all taken away, and the race washed out. Opposite to Hizer's, but over the State line, J. Chandler's smith shop, was swept off with its contents--the water here rising eight feet above its usual level, and four feet higher than the flood of l795, and according to tradition, the same height above a flood which is said to have occurred in l740. The smith shop was standing in l795, and had a mark on it showing the height of the flood of that year. Next below Hizer's factory is the paper mill of Daniel Farra. The dam was taken away, with a considerable amount of personal property. The water here was ten feet above its usual level. Mr. Farra had a dam on a small stream which empties into Beaver creek, which was also carried away. Higher up on this branch the dam and race of Mr. Morrison's smithery was broken. Next below Mr. [PAGE 55] Farra's paper mill, is the upper flour mill of Isaac Smith. This mill is in Delaware state, but the dam is in Delaware county. The dam was carried away to its foundation. The water here was twelve feet above its usual level, and was at its greatest height about four o'clock. Thomas Brinton and Joseph P. Harvey, on another tributary of the Brandywine, in the northern section of Birmingham, near the State road, had their mill dams broken, but the committee have been unable to learn the amount of their losses. This stream was higher than ever before known. Naaman's creek was also very high, caused principally by the heavy rain in the neighborhood of its head waters. Col. Thomas Robinson had a small barn with a quantity of hay carried off, and Mr. Churchman lost a quantity of lumber, logs, &c. by the flood in this stream. Some other damages occurred on this creek, but the amount was inconsiderable. Besides the above, some damages occurred at other points beyond the borders of Delaware county, but nothing of a very serious character so far as the committee have been informed. Our little county appears to have been destined in a peculiar manner, to bear nearly the whole brunt of the calamity. The shock was so sudden and so violent, that for a few days the people stood aghast, almost ready to believe that their county had been overwhelmed in irreparable ruin. This feeling, however was of but short duration. Their recuperative energies were soon brought into full play, and already much of the injured property has been restored to its former condition, and in many instances the new works are in every respect superior to those which they are intended to replace. It is now apparent to everyone, that but a few years of [PAGE 57] prosperity will be required to replace the county, in every respect, in the same enviable position which she has so long enjoyed. As large as was the amount of property destroyed, the poor were the heaviest sufferers in proportion to their means. "Twenty families had their houses with their contents carried away, and more than 100 other families met with severe losses, in proportion to their means, by the destruction of furniture, household utensils, provisions and other necessaries, that render the abode of the poor man comfortable. Among these were 21 widows with families containing 52 children. "* [Report of the Relief Committee] The first efforts of our people were turned to the relief of these indigent sufferers. In this they were liberally aided by the city and county of Philadelphia, and the county of Chester. The sum of $3,375.07 was contributed, and placed in the hands of a general committee raised for the purpose of receiving and making distribution of the same. From this fund the committee have been enabled to extend aid to 131 families, including 404 children. Independent of this fund, considerable amounts have been contributed in different neighborhoods, expressly for the relief of particular sufferers. The buildings which were carried away, and those wholly or nearly destroyed, if placed contiguous to each other, would constitute a considerable village. In this connection may be enumerated 30 dwelling houses, eight manufactories of different kinds, two flour mills, three saw mills, two paper mills, besides 20 other buildings of various descriptions. In addition to these, 53 mill dams were either entirely swept out, or very much damaged. In fact scarcely a mill property on the inundated streams escaped without injury to some extent, and besides the buildings above enumerated, very many were seriously injured. It was the original intention of the committee, to have furnished an estimate of the [PAGE 58] loss of each description of property, but from the returns made to them, they will be obliged to adopt a different course. The loss of each individual (as furnished to them) will be presented in the aggregate. So far as the agricultural interest of the county is concerned, no estimate of individual losses will be given, although in some instances it was very severe. The destruction of crops and fences, and the ruin of meadow lands are so wide spread, and embrace so many individual cases as to forbid the committee from attempting more than a general estimate, which they feel well assured is rather below than above the amount of this kind of damage which was actually sustained. It must not be inferred that the above sum will cover the whole county loss in the way of bridges. The water ways furnished by the arches of nearly all of our stone bridges were wholly inadequate, in the time of a high freshet, and in most instances where these arches have been swept out, economy, as well as prudent foresight, suggests the propriety of supplying their places with wooden structures. This plan of rebuilding these stone bridges, has been adopted in some instances, and it is understood, will be adopted in others. By pursuing this course the present cost will be greatly diminished, but the permanency of the structure (every other cause of destruction and decay considered, except high freshets,) will not compare with the stone arches which it is intended to supply. In other instances where the extended wings of a bridge have been carried away, but a small part of them will be rebuilt, in order that they may present less obstruction hereafter to the passage of high freshets. The roadway will [PAGE 60] not be quite so good, but the safety of the bridge will be promoted. The real amount of loss to the county, cannot, therefore fall much short of $40,000. The damage sustained by some of the townships in the destruction of small bridges and culverts, and in the tearing up of the roads, was very considerable. A moderate estimate will make this item of loss amount to the sum of three thousand dollars for the whole county. The following list of individual losses on the several inundated creeks has been principally made out from the estimates furnished by the individuals themselves, or from persons residing in the vicinity of the places where the losses occurred. In a few instances, it is probable these estimates are too high, while in others they are believed to be below the amount actually sustained. The aggregate amount will vary but little from the truth. Sundry other persons, in small amts. On tributaries of the Brandywine. (Foot note from preceding page) *By adding to the above estimate of losses by the flood, that which was caused by lightning, and that caused by the wind ill prostrating orchards and forest trees, tile amount of private loss will not be less than $200,000 dollars, within the borders of Delaware county, and the aggregate of public and private losses will not fall short of a quarter of a million of dollars. The time at which the flood in Darby creek attained its maximum height, was from half an hour to an hour later than in the other creeks. The difference in those streams does not appear to have been considerable. The greatest height of the flood in Darby creek was seventeen and a half feet; in Crum creek twenty feet; Ridley 21 feet, and Chester 33 feet. A large freshet occurred in this county in the year 1795, another in the year 1822, and another (probably still larger) in the year 1839, but neither the memory of man, nor tradition affords any evidence of a flood that would bear a comparison with that of the 5th of August last. Neither were any traces to be found along the valleys of the streams (similar to those now to be seen, particularly along Chester creek) to justify the belief that the county had been subjected to such a visitation, during a period of many centuries. We are informed by Mr. Enos Sharpless, that the flood of 1795 gave rise to a good deal of speculation at the time, as to the cause why there should be higher freshets than had formerly been. Some attributed it to the land having become more cleared, affording the water a better chance to run off, others appeared serious in attributing it to the introduction of plaster of Paris and its tendency to attract moisture; but all agreed that the freshet of that year was the highest that they had ever seen, and as there were people then whose recollection would extend back fifty or sixty years, Mr. Sharpless thinks we may safely conclude that that freshet continued to be the highest until the freshet of 1839, which was one foot higher, and now he remarks, "we have one in 1843, seven feet three inches higher than that." It must also be observed that the [PAGE 65] quantity of water passing down increases in a ratio much beyond the increase of depth, as the cross section of the valley of the creek increases as the flood rises, and the velocity of the current is also greatly accelerated by its increased depth. It is probable, therefore, that the quantity of water which passed the mills of Mr. Sharpless in a given time in the flood of 1843, was much more than double that of 1839, and if the comparison were made on Chester creek, it would probably quadruple that flood in the quantity of water which passed in a given time. LOSS OF LIFE AND RESCUES FROM DROWNING. The most melancholy part of the duty of the Committee consists in recording the circumstances connected with the sacrifice of human life, which was occasioned by the flood. Nineteen individuals, most of them children and young persons, were suddenly, and almost without warning, deprived of their lives; and this too, under circumstances peculiarly distressing to their relatives and friends. To persons who cannot bring their minds to realize the almost instantaneous rise in the waters, the number lost by drowning may appear large, but in reality it should be regarded as almost miraculous, that so small a number should have perished. The numerous hair-breadth escapes and rescues from the most perilous situations, will sufficiently show what trivial circumstances prevented the number from being very greatly increased. Had the inundation occurred at midnight, when most persons are wrapped in slumber, the destruction of human life would have been dreadful indeed. Such a calamity can only be contemplated with feelings of horror. Seven lives were lost on Darby creek. When the stone bridge at Darby yielded to the torrent, two young men--Russell K. Flounders and Josiah Bunting, Jr., were standing upon it. Both perished. The body of the former was carried [PAGE 66] by the current to the meadows, a distance of two miles, where it was found after four days search; the body of the latter was engulfed amid the wreck of the masonry of the bridge, and was not discovered until the lapse of two weeks, though the most diligent search had been made. Mr. Flounders was in the twenty-first year of his age, and Mr. Bunting in his nineteenth. Both of these young men gave great promise of future usefulness, and their early and melancholy death proved a severe trial to their numerous relatives and friends. Several persons had left the bridge but a short time before it gave way. At the cotton factory occupied by D. & C. Kelly, on the New London turnpike, five lives were lost. A frame tenement stood immediately below the western walls of the bridge, and between the factory building and the creek. This dwelling was occupied by Michael Nolan and his family, consisting of his wife, five children, and a young woman named Susan Dowlan. Before any immediate danger from the rise in the water was apprehended, Michael and his eldest son had left the house with the view of making arrangements for the removal of the balance of the family. There was no water about the house when the father and son started upon their errand, yet upon their attempt to return, after an absence of less than five minutes, it was not in the power of anyone present to reach it, much less to render the inmates any assistance. The wing walls of the bridge soon gave way. Shortly after this, the house was swept from its foundations--instantly became a complete wreck and all the inmates perished, with the exception of Susan Dowlan. Thus in the space of a few minutes, after they became aware that they were within the reach of danger, a mother and her four children were deprived of their temporal existence, leaving a disconsolate husband and father, and a son and brother to deplore their untimely fate. Julia Nolan, the mother, was 38 years of age, and her children, whose names were James, Thomas, Michael, and Ann, were respectively aged fifteen, nine, five and three [PAGE 67] years. All the bodies were found some distance below on the following day. Susan Dowlan, the other member of this ill-fated family, had her life preserved under circumstances which scarcely presented one chance in ten thousand. As the water rose the inmates of the house retreated to the second story for safety, but it was not until the wing walls of the bridge gave way, that they realized the danger to which they were exposed. In less than half an hour after the yielding of the bridge walls, the house began to fall in pieces, and they were all precipitated into the roaring torrent. Being resigned to what she believed would be her inevitable fate, she commended herself to the mercy of her Maker; and while struggling in the water (to use her own expression,) "in the agonies of death," she made a grasp with the hope of seizing one of her more unfortunate companions, as she "dreaded to die alone." In this effort she caught hold of the branches of a tree, standing immediately on the margin of the channel of the creek, and, at length, obtained a foot hold on a knot which slightly projected from its trunk. This tree is about sixty yards from the site which the house had occupied, and a shorter distance from the arches of the bridge, from which the water rushed with impetuous fury. Though the position of the knot kept her for a considerable time immersed in water up to her waist, she was in a measure shielded from the force of the current by the trunk of the tree. She remained in this position for the space of three and a half hours, no one on shore being able to render any assistance during that time, though they could distinctly hear her piteous cries for help. At length when the flood had somewhat subsided, Messrs. Charles McClure, John Cunningham and John Heller, made a praiseworthy effort to relieve her. They all crossed the rapid current which still swept round the bridge, and reached a position where the water was less deep, and within a short distance of the tree upon which Susan stood. At the risk of his life, Mr. McClure swam with one end of a rope and [PAGE 68] succeeded in reaching the tree just in time to save her from yielding her position, and consequently her life, from exhaustion. Securing the rope to her body, and by the assistance of Messrs. Cunningham and Heller, he was enabled to rescue her from a watery grave. Thus it will be seen that Susan Dowlan owes her life to a combination of circumstances which the most inventive imagination could scarcely have pictured to subserve the purposes of fiction. At Garrett's factory, also occupied by D. & C. Kelly, three families, numbering sixteen individuals were for a long time placed in the utmost jeopardy. Their retreat to the land was wholly cut off by the sudden rise in the water. The houses they occupied were completely wrecked, and large portions of them carried away. They had nothing left but their tottering ruins to afford them the least security. These fortunately withstood the force of the current, though every individual had given up all hopes of surviving that dreadful night. No lives were lost on Crum creek, nor are the Committee aware that any persons were rescued from situations of great peril upon that stream. On Ridley creek five lives were lost--a father and his four children. George Hargraves, his wife and four children, resided at the factory of Samuel Bancroft. A long stone building which had been converted into four dwellings, stood in a very exposed situation between the factory and the steep acclivity on the west side of the creek. One of the middle dwellings was occupied by George Hargraves, his wife and five children, and William Hargraves ,the brother of George. The other middle house was occupied by Thomas Wardel Brown, his wife and child. In endeavoring to secure the property in the basement of their dwellings, these persons delayed making their escape until all chance of doing so was gone, so sudden was the rise in the water at this place. They retreated to the second story of their house, and occupied one of the bed rooms--the water continuing to rise with fearful [PAGE 69] rapidity, until at length it burst through the building carrying away the two middle dwellings, and with them George Hargraves, the father, and his four older children, into the destroying flood, but they were not immediately drowned. William Hargraves, when he found the walls of the house were yielding, plunged into the flood, and by this step not only succeeded in preserving his own life, but was placed in a situation to witness what befell his less fortunate brother and his brother's children, up to the time their lives were sacrificed to the impetuous fury of the flood. William supposes that part of the wall of the house struck him and carried him under the water, but he at length succeeded in reaching the surface, and was carried down by the current nearly half a mile, with the logs and drifting timber at times passing over him. At one time he thought he would not again be able to reach the surface, so long was he kept submerged by these floating materials. After catching in vain at every twig or branch which came in his way, he at length encountered a standing tree, to which he held, and was not afterwards subjected to further danger. When William reached this place of security, he supposes George and his children were about one hundred yards behind him. They, however, soon swept past him on a bed, George calling out as he passed, "Hold on to it, William." Scarcely had George given this admonition to his brother, when he and his four children were swept from their position on the bed and engulfed beneath the turbulent waters of the flood, not to rise again. George Hargraves was aged 38 years, and his children, Sarah, Andrew, George and Samuel were respectively aged 13, 11, 9 and 6 years. Their bodies were found about a mile below, the body of the youngest child being clasped in the arms of its father. William Hargraves maintained his position in the tree during four hours when he was rescued and brought to shore by means of a rope. He says that during all the scenes of peril through which he passed, his presence of mind at no time forsook him for a single moment. Jane Hargraves, the wife (now widow [PAGE 70] of George) at the time the flood burst through their dwelling was standing near the corner of the room with her infant child in her arms. This part of the floor (but a few feet square) and this only remained. Upon these projecting boards this woman with her child stood for the space of nearly five hours, when she was rescued by Mr. Thomas Holt. Thomas Wardell Brown, his wife and child, occupied a corresponding part of the floor of his dwelling, but of scarcely half the dimensions of that upon which Jane Hargraves stood. They also were standing upon this part of the floor, when the flood burst through their dwelling, and this was the only portion of it which was not carried away. They were rescued about the same time as Jane Hargraves. It would be difficult to describe the feelings of people under such circumstances, particularly those of Mrs. Hargraves, who just before had seen her husband and all her children, except the infant in her arms, borne away from her on the bosom of the flood. About eighty yards above Sherman's upper factory, a double frame house was occupied by William Toombs and James Rigley, with their families. This building with its inmates was floated off, but in its progress down the stream it encountered the inshore end of a more substantial dwelling, which gave it a direction towards the wheel house of the factory against which it lodged, in a position opposite to a window of the picker house. From the upper window of his dwelling (which was partly under water) Rigley not only escaped himself to the second story of the picker house, but succeeded in rescuing his wife and child. But his good offices did not end here. Toombs (who was sick), his wife, and two children were in the garret of their dwelling, shut out from the light, the roof being partly under water. Rigley, after placing his own family in safety, made an effort worthy of all praise, to rescue his fellow sufferers. He returned to the almost submerged building, broke a hole through the roof, and took Toombs and his family and placed them safely in [PAGE 71] the picker house. "In half a minute," as he expressed himself, after he had returned to the building the last time, their late dwelling was whirled over the wheel house, dashed to pieces and carried down the stream. Mr. Rigley stated that but six minutes had elapsed from the time the house lodged against the wheel house until it was carried down the creek. Edward Lewis, Esq., and his son Edward were placed in a situation of great peril. They were in the third story of the grist mill, when the building began to yield to the force of the flood - their paper mill and saw mill having previously been swept a way, and a current of great depth and velocity passing between the mill and their dwelling, across which was their only chance of retreat. A great part of the walls of the mill was carried away. and the roof and timbers fell in confusion around them, but fortunately enough of this building remained firm to save them from a watery grave, which at one time appeared, both to themselves and to others who witnessed the awful scene, to be their inevitable fate. They were at length, however, rescued by the use of a rope. On Chester Creek seven human beings were deprived of their lives by the flood, and many persons were placed in situations of great jeopardy. Mary Jackson, a colored woman aged 25 years, while assisting her husband to save some wood on the meadow near Flower's mill from being carried away, was overtaken by the sudden rise of the water and drowned. It appears that her life might have been preserved had it not been for her hesitancy in fleeing to the nearest point of safety. Her body was found shortly afterwards, and while still warm. This woman appears to have been held in high esteem by those who knew her, and she has left a husband and several small children to deplore her untimely end. Near the same place where Mary Jackson lost her life, the life of Mr. William G. Flower was subjected to the most imminent peril. Mr. Flower was upon the meadow when the flood came down in a wave, (represented by the spectators as [PAGE 72] being from three to four feet high) and swept him a way. He was carried from his path into an old race where he succeeded in catching a grape vine attached to a tree standing on the race bank, by means of which he succeeded in gaining a position on the tree, which, however, was soon uprooted and borne away. After a short period of extreme peril during which he was several times overwhelmed by trees, timber, &c., borne down with frightful velocity by the flood, he was again lodged in the branches of another tree, larger and less exposed than the one from which he had been carried. When he disappeared under the floating trees and timbers, the by-standers supposed he was inevitably lost, and left the station they had occupied on the shore. He had great difficulty in gaining a position on the second tree, in consequence of exhaustion, but when he succeeded he remained there in comparative ease and safety. He was at length discovered in this situation by persons on the shore, and as soon as the flood had somewhat abated, and the stream ceased to bring down floating timbers, &c., (which made any attempt to reach him extremely perilous,) Mr. Abner Wood, with a courage and benevolence which deserves the highest credit, swam off to him with a rope, by means of which he was safely brought to the shore. This was at half past nine o'clock, when the water had fallen ten feet. No lives were lost at the town of Chester, but several persons were placed in a situation of great peril in the house occupied by William Kerlin, Jr., adjoining the eastern abutment of the suspension bridge. The narrative of the exposure of these persons, will be given nearly in the words of Caleb Peirce, who communicated the same to the committee, and who happened to be one of the party. It also gives a very good idea of the extreme suddenness in the rise of the water at that place. Mr. Peirce observes, that "Mr._______, myself and little son were standing on the pavement near my door, when a person passed by, calling out, 'Mr. Pierce, there is a freshet coming down the creek: Flower's bridge is [PAGE 73] gone.' We immediately proceeded down to the suspension bridge, and when we arrived there, we found the creek about as usual, but could see a tremendous wave, as it were, come tumbling over and over, a short distance above, and moving with great force and velocity. The bridge and eastern abutment soon became crowded with people, when I took my boy and went into Mr. Kerlin's shop and looked out at the front door. I suppose we remained in the house, looking at the wreck going down the stream, such as bridges, detached parts of factories and mills, cotton bales, casks of various kinds, carriages, hay stacks, &c., about ten minutes, when we came to the back door (in view of the bridge). The people had all retreated, and the water was rushing with great violence between us and the town, to the depth of from four to six feet, so as to make it extremely dangerous, if not impossible, to reach it. Here we had to remain, the water rising with great rapidity until 8 o'clock and 5 minutes, at which time the flood reached its extreme height. For about half an hour preceding the extreme elevation of the flood, we expected every moment to be carried away. The water then fell with as much rapidity as it had risen, and at a quarter past nine o'clock, the water had disappeared between Mr. Kerlin's house and the town....If the eastern abutment of the bridge had given way as the western did, we all would inevitably have been lost, and we should therefore feel very thankful for our safe deliverance from such a perilous situation." Besides Mr. Peirce and his son, and Mr. Kerlin and his wife, there were five other persons in the house. Mr. Jonathan Dutton was placed in a situation of extreme jeopardy. While endeavoring to place some of the property in his mill out of the reach of the flood, he was surprised by the sudden rise of the water to an alarming and unprecedented height. He retreated from story to story of the mill, until he reached the upper one. His situation soon became more awfully perilous, for the mill began to yield to the force of the torrent. Knowing that his situation had now become [PAGE 74] desperate, he leaped from a window in the mill, and with great exertion succeeded in reaching the shore, about one hundred yards below. He saw the mill no more. If Mr. Dutton had remained in the mill a moment longer, he inevitably would have perished. We now come to narrate one of the most tragical scenes which the flood has given rise to. John Rhoads, an Englishman by birth, but for many years a resident of the vicinity of Pennsgrove, a man past the prime of life, with his daughters Hannah and Jane, both respectable young women, together with Mary Ann Collingsworth, the grand daughter of John Rhoads, were swept off in their little dwelling, and all drowned. Mary Ann, the grand-child, was a highly interesting little girl of seven or eight years of age, and had just arrived from Manayunk, the residence of her parents, on a visit to relatives in the vicinity of Rockdale. Her afflicted mother was not only left to mourn the loss of her child, but her two sisters and aged father. Hannah and Jane Rhoads were aged about twenty-five or thirty years. The old gentleman had been advised to seek a place of more safety than his dwelling afforded, but he felt secure and remained until all chance of escape had gone. In giving a detail of the loss of property by the flood at Pennsgrove, it will be remembered that one of the houses belonging to John Rhoads, which was carried off, was in the occupancy of Thomas McGuigan and Mrs. Morton. The only portion of the family at home in this house, at the time of the sudden rise in the water was Mary Jane McGuigan, the wife of Thomas McGuigan, a young married woman with her only child, a babe at the breast. The body of John Rhoads was found two and a half miles below, and that of one of the daughters, at the mouth of Baldwin's run, still two miles lower down the creek. The body of the other daughter was carried down into the Delaware, and was found near the mouth of Naaman's creek, below Marcus Hook. The bodies of Mary Jane McGuigan [PAGE 75] and her infant, and that of the little girl from Manayunk, have not yet been found. * [*The body of the little girl has been found since the manuscript of this report was placed in the hands of the publisher. The heavy rain which occurred on the 17th of January, caused a freshet in the creek which removed a deposit of earth made by the flood of the 5th of August, a short distance from the place where the houses of Mr. Rhoads had stood, and exposed the remains of this child. They were identified by the clothing.] The occupants of the other houses which were carried off, escaped early, some of them by wading the current which swept around their dwellings at imminent hazard, as it rose with fearful rapidity. In Pennsgrove, a house occupied by Samuel Riddle, standing very near the four tenements of John Rhoads which were carried away, became a resort for several females, as a place of safety. These, with the resident inmates, all females, (Mr. Riddle himself being at the factory,) were, during a long time in a very perilous situation. A survey of the present ruined condition of this house cannot but cause a shudder, with the fact in view, that here were twelve or thirteen young women in an upper story without a chance of escape, while every thing around them had been washed away. Full in their view, house after house had swept by, and amidst the roar of troubled waters, the crash of falling timbers, and the shrieks of the perishing Rhoads family, here they were with no other reasonable expectation but immediate death. Some of these females manifested a firmness and resignation of rare character; and after they had, on bended knees, with their hands clasped in each other's, committed themselves body and soul to Him who controls the winds and "taketh up the waters as a little thing," they waited with true Christian fortitude in momentary expectation of a watery grave. But the frail building which they occupied was not destined to fall. A large tree bent over to protect an exposed [PAGE 76] corner, and though itself partially uprooted, served to parry off heavy drift wood, and to divide the current. Another exposed corner was "founded upon a rock." The rock itself was nearly undermined, but yet it moved not, and the present appearance of this ruined dwelling excites surprise, that being so nearly washed down, it should have continued to stand. In beholding it one is forcibly reminded of those passages in the Old Testament, which refer by comparison to the influence of floods in the mountainous regions of that land, the history of which is of so lively interest to a Christian people. DENUDING AND TRANSPORTING POWER OF THE FLOOD. Nothing connected with the late freshet has caused more astonishment than the numerous facts which it has given rise to, exhibiting the power of deep and rapid currents in transporting materials of a higher specific gravity than water-that is, materials of a greater weight than water, bulk for bulk. Rocks of great weight, and materials composed chiefly or wholly of iron, were in many instances transported to very considerable distances from the places which they had previously occupied. In the transportation of rocks and stones in water, it must [PAGE 78] be borne in mind that their weight is greatly diminished by being immersed in that fluid. Very few rocks have a greater specific gravity than 3, and the greater number do not much exceed 2.5. The heaviest varieties of rocks will therefore be deprived of one-third of their weight, and the lighter kinds which are found in this county, will weigh two-fifths less in water than in the air. But in regard to materials composed of iron, the comparative difference in weight will be inconsiderable, as this substance is deprived of less than one-seventh of its weight by immersion in water-its specific gravity being from 7.6 to 7.8. It has been laid down "that a velocity of water equal to three inches per second, is sufficient to tear up fine clay---six inches per second, fine sand---twelve inches per second, fine gravel---and three feet per second, stones the size of an egg." It is doubtful whether results given as the above, without any reference to the depth of the water, can be of any practical utility; for it certainly does appear that the power of water to transport ponderous substances depends, in some degree, on the depth as well as on the velocity of the current. Numerous facts in support of this position might be referred to as the result of the flood under consideration. Rocks, stones, gravel, &c., are almost uniformly deposited where the current of the flood became more shallow, and in very many instances, apparently in the face of a current equally rapid with that which brought them to the point at which they rested. In a clear, shallow stream, with a stony bed and a moderate velocity, we see that the water when it comes in contact with each small stone, or other inequality in the bed, rises over it, causing in the surface of the stream somewhat of the unevenness of the bottom, and giving rise to what is usually termed "ripples." Now the same thing will undoubtedly take place to some extent, when the water is much deeper, and the obstructions much larger. But will not the power of the water to rise over an obstruction be diminished, in a [PAGE 79] measure, as the stream increases in depth, supposing the velocity to remain the same? If that be true, it must be perfectly apparent, that a point will be reached where the difficulty experienced by the deep water in passing over the obstruction will be so great that the obstruction itself must yield its position, and be carried down the current. In passing over the same descent, the increase in velocity which a stream acquires as it becomes deeper, is, no doubt, very considerable, and full allowance for this should be made in explanation of the fact that these heavy materials are usually deposited at points where the water is diminished in depth; but it should also be borne in mind, that this increase of velocity is much greater at the surface than any near the bottom of the stream--the velocity always being the least at the bottom. The friction of the water over these ponderous obstructions is another ingredient which must be taken into account in explaining their transportation. Loaded as the water is with heavy sediment during the time of a great flood, with its depth and velocity greatly increased, its friction on the bed of the stream, or upon obstructions resting on the bed, must be very considerable. In fact it is only necessary for the friction of the water, in passing over an obstacle, to exceed the friction the body in moving would have on the bed of the stream, to insure its transportation from this cause alone. It will be difficult to explain the removal of certain thin, flat stones of considerable dimensions, which actually took place, without taking this item of force largely into the account. To enter into a full detail of all the facts under this head, which came to the knowledge of the committee, would be tedious and uninteresting, and could answer no valuable purpose. In the details of the flood which have already been given, sufficient evidence was exhibited of its tremendous force, in the sweeping away of mill dams and bridges, of mills and dwellings, and in the uprooting of many trees, and the disseverance of the massive trunks of others. The [PAGE 80] comparatively few facts which will be added, will be such as have a geological bearing, or which more appropriately belong under the head of this section. Many places along all the creeks exhibit the denuding power of the flood, which swept along their valleys in a striking manner. Very many meadows are greatly damaged by having the soil removed in some places, and large deposits of stones, gravel and sand made in others. The sites of many gardens, or beautiful plots of grass, now exhibit nothing but the naked rock, or lie buried beneath a mass of detritus, several feet in depth. The beds of the streams are in many places deepened, and in others wholly or partially filled up. On Ithen creek, near J. Evans' mill, a trap rock, more than seven feet long and two feet square, was removed many yards from the place where it had before laid. Near this place the channel of the creek was deepened six feet, and a short distance below its bed, was nearly filled with large and small stones. On Darby creek the denuding power of the flood was exhibited in a very extraordinary manner, on the estate of Thomas Garrett, deceased. The surface from a considerable portion of the valley of the creek was carried away, and in many places to a great depth. It will be remembered that an unoccupied house was carried from these premises. Not only every vestige of the house was removed, but the earth has been excavated to a considerable depth below its foundations. At Lobb's cotton factory, occupied by D. & C. Kelly, several iron shafts were carried a distance of one hundred feet and lodged in the tail race of the mill. One of these shafts was ten feet long and six inches square and was partly buried in the earth. There was, however, a small iron wheel attached to one end of this large shaft, which no doubt aided in its transportation. A short distance below, a rock estimated to weigh about two and a half tons was carried from the bed of the creek, and now lies two hundred yards below, on an adjoining flat. On Crum creek, at T. C. Palmer's mills, the excavating power of the flood was very strikingly exhibited. A portion of his dam was swept out, and below the breach an excavation was made to the depth of twelve feet. Part of the excavation occupies the former site of his wagon house, which was undermined and carried away. At Beatty's mills, and at Lewis' mills, the denuding and transporting power of the flood were strongly marked, in the excavations which it caused, and in the removal of heavy materials. A breach of twenty or thirty feet in extent was made by the ice freshet of 1839, in the stone breast of the dam of Enos Sharpless, on Ridley creek. This breach had been rebuilt with large stones, weighing from ten to twenty hundred weight, and in order to make it more secure, these stones were fastened together with straps of iron from one half inch to one inch square, being bolted to the stones, and thus two, three or more of these large stones were connected together all through the wall. This part of the wall was all torn out by the flood, and no two of these large stones were found fastened together, but in nearly all cases the bars of iron were broken off--in a few cases in which the bolts were drawn out, the bars have been twisted and bent as if they had been no more than bars of lead. Three of these stones having been thus fastened together on the wing-wall of the dam, were carried sixty or eighty yards down the creek, where two of them, but little short of two tons weight each, lodged against trees with the irons broken off. On a meadow of Mr. Sharpless a quarter of an acre was divested of its surface, and an acre covered with stones, gravel and sand. A meadow of about five acres, belonging to Jonathan Thomas, was excavated to the depth of four or five feet in some parts, and in other parts covered with a deposit of stones, gravel, &c., to the depth of three feet. Great changes have been produced in many places along the valley of this stream, many of the rich flats have been rendered nearly valueless by deep excavations or heavy deposits of stony materials. In the vicinity of the factories [PAGE 82] of C. Sherman and that of S. Bancroft, and of the mills of Edward Lewis and Amor Bishop, it will require ages to obliterate the traces which have been left by the flood. Many trees, some of them of a large size, were uprooted, or had their trunks dissevered upon this stream, and were carried down. But the most indelible marks of the flood will be found in the valley of Chester creek. In fact the changes produced upon this stream are so similar in character, that it would be useless to enter into a general enumeration of them. What occurred at a few places will serve to illustrate the power and force of the flood in this stream, throughout nearly its whole length. Even as high up as the residence of the Hon. Henry Myers, in Concord, every streamlet and ravine passed torrents of water, carrying with it earth, gravel, stones, and rocks, and depositing them on the fields and meadows, so that even here the marks of this flood will remain for many years to come. Along Green's creek, a more southerly branch, large trees were uprooted and carried down, and the surface in many places excavated in such a manner as to make it very apparent, that the district of country drained by this small stream was subjected to rather an undue share of the heavy rain. Below where this stream enters the main West branch, the changes continue in an increased degree. On this stream above its junction with the East branch, the power of the current was remarkable, and scarcely within the belief of persons who have not witnessed the like. Mr. Crozer's West branch dam was built of stone of a large size. Nearly all of them were such as would require a yoke of good oxen to haul with timber wheels on level ground. These were carried down the stream from one to four hundred yards, and along the bed and margin of the natural channel, rocks of many tons weight were removed from beds in which they had probably laid for ages--upturned, and in some instances, carried down a number of yards. A flat between the West branch dam breast and the factory, has a deposit of coarse sand and gravel averaging nearly two feet in depth, and covering more than half an acre. Another flat opposite Crozerville factory, is covered with rocks, stones, and gravel, to the extent of more than two acres, and the creek at the same place, which flowed heretofore in a bed flanked by banks of from four to six feet high, has entirely changed its channel--the old bed being filled up with stones and coarse gravel, so as to form a surface level with the former banks. On the opposite side, and in the forks of the creek, as has been before mentioned, a deposit of mud four or five inches deep covers a lot of three-fourths of an acre, while large beds of sand are piled up in various places. The annexed cut (next page) will serve to illustrate the relative situation of these deposits. The cause of the deposits of mud being made at this point is sufficiently explained in another part of the report. The largest rock noticed, the resting place of which had unquestionably been changed by the flood, was one near Crozerville dam. This rock is estimated to weigh from ten to twelve tons, and was removed a distance of four or five rods. Its former position was well known, but what confirms the fact of its removal beyond a single doubt, it was found resting against and upon another rock with a piece of domestic goods between the two. b. deposit of gravel and sand. c. deposit of rocks, stones and gravel. Beaver creek, though a small stream, was very turbulent, and rushed into the Brandywine with so much force as to dam that stream more than a mile above their junction, and causing heavy deposits of mud, gravel, &c., along its valley. Immediately below the mouth of the creek, on the meadow of Elihu Talley, this deposit is four feet deep in some places, and covers about two acres. On this small stream, near Smith's mill, a rock nine feet long, seven feet wide, and three and a half feet thick was removed ten feet from its former position. The deposit of mud that was made at the junction of the two main branches of Chester creek, sufficiently attests how [PAGE 85] heavily the waters of the flood were charged with earthy particles. The amount of mud which was carried down and deposited in the Delaware, must have been incalculably great. The destruction of property did not end with that which was caused by the wind and flood. The large stone barn of Lewis Davis, in Haverford, was struck by lightning about five o'clock in the afternoon, and after the most persevering efforts to extinguish the fire which had been communicated to the hay contained in the building, continued by the people of the neighborhood for the space of three hours, the barn together with about fifty tons of hay and a quantity of wheat and oats, was consumed. The loss of Mr. Davis cannot be less than two thousand dollars, and that of another person who had his property in the barn, about one hundred dollars. The electric fluid with which the clouds appeared to be so highly charged, took effect in several other places in the county, but did not cause any serious damage, so far as the committee are informed. On the night of the flood, the air was bland, with a light breeze from the southeast. The moon occasionally shed its rays through the floating clouds, while the light caused by the burning of Mr. Davis' barn, was visible all over the county, and constituted a brilliant though awful finale to an event which in all time to come must mark an epoch in the history of the county of no ordinary importance. For the accompanying Map of Delaware county, the committee are indebted to William H. Wilson, Esq., of Haverford. It was drawn expressly to illustrate the subject of this report, and was not intended as a map of the county to be used for general purposes. In the construction of it, much has therefore been purposely omitted which would be useful in such a map. In fact, the greater part of this map was reduced from a large, unfinished, manuscript map of the county, drawn many years ago, by Mr. John Hill. This old [PAGE 86] map, so far as it was completed, is known to contain many inaccuracies. A few of these have been corrected, but no doubt several of them have been introduced into the new map. In laying down those parts of the county which are incomplete in the old map, the data upon which Mr. Wilson had to rely was necessarily of such an imperfect character that little doubt exists but several errors have found a place from this cause. The map, however, is handsomely executed, and will serve the purpose for which it was intended, equally well with one that had been made out from an accurate survey of the county.